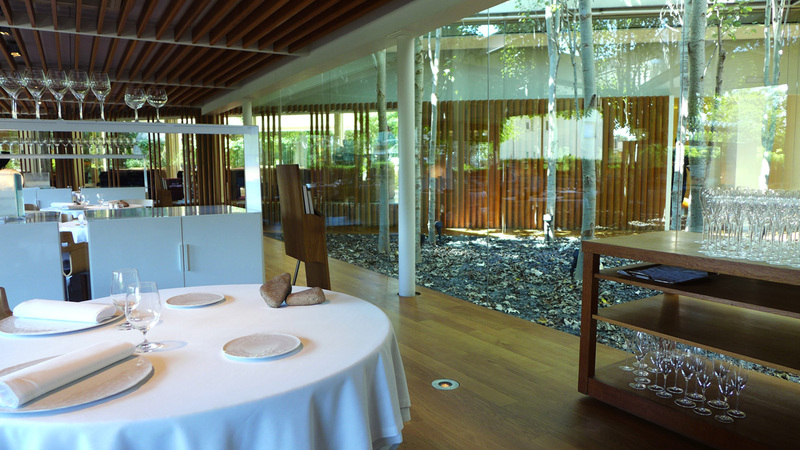 El Celler de Can Roca , Girona.The “ Worlds best restaurant 2013 “…..quite an accomplishment and an even greater reputation to keep hold of once you`ve earned it. 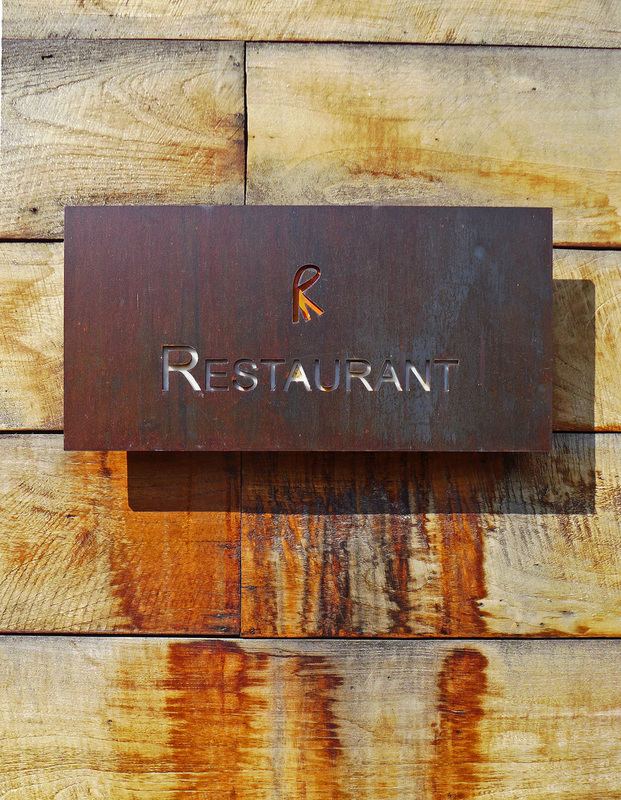 An establishment that`s virtually impossible to just `slip in` for a meal there unless you`ve pre- secured your table ” one year ” in advance.If you want to eat there then be prepared for a bit of forward planning and a hell of a long wait. Do i think it`s the Worlds best ? No i don`t but read on and alll will be revealed. Getting the reservation is obviously the first thing you`ll need to be doing if you want to try the experience. 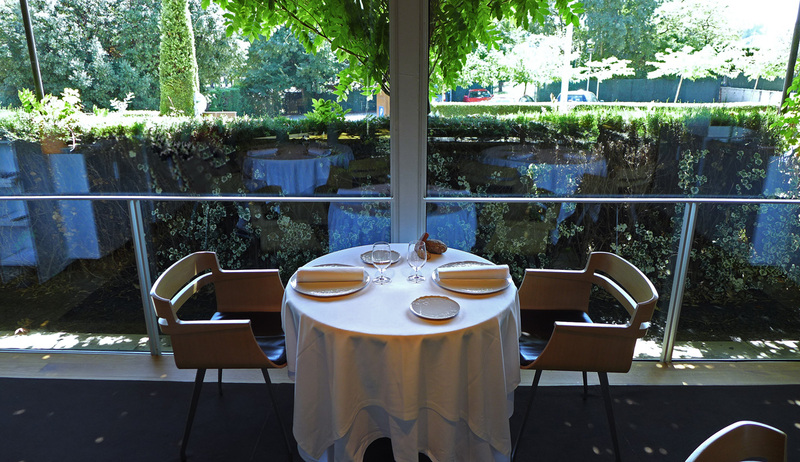 Get the table first and then book the hotel, flight and organise everything around the Can Roca meal. I wrote an email to the restaurant in April for a table in August and their reply arrived a day later with the news that i would have to book at least 10 months in advance. This was even before they got the Number 1 slot. 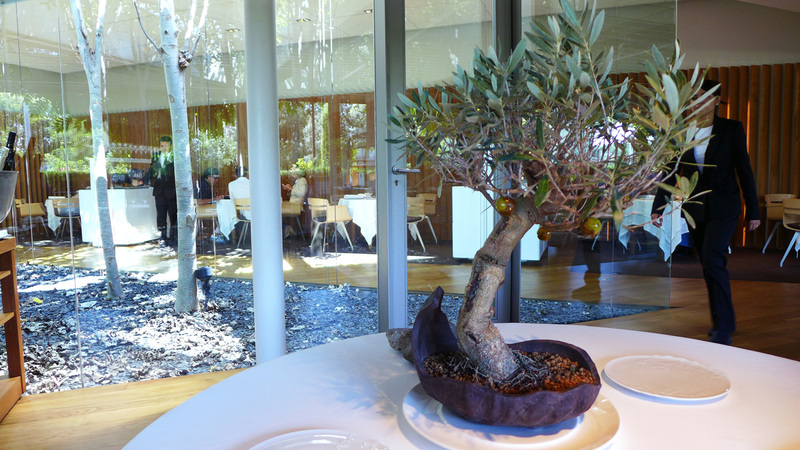 I wrote a further nice email asking them to allocate me a table “whenever” one was available and i would then book my whole Girona trip around a Can Roca table time….Magic , it worked , they found me a spare reservation and i was offered a lunch or dinner slot for the week that I required it. Please note that now they`re holding the title i believe waiting times have risen to over a year so in a nutshell book this September for next September. 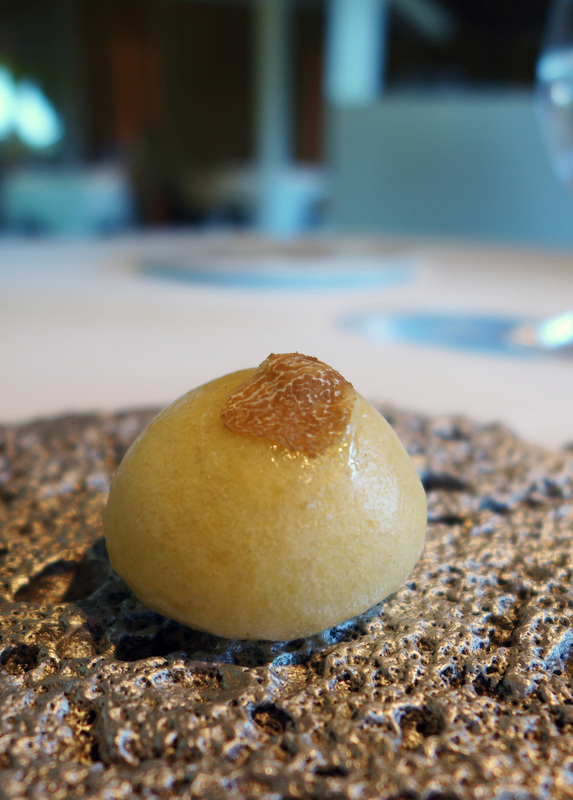 I`m not going to babble on forever about Can Roca , i`ll let the photos do the talking for themselves. Any information that you`ll need along with dozens of blog posts are all online…just google it. I`ll just fill you in on a few minors to assist anyone that`s heading out there. Flights are straight forwards from the various UK airports to Girona – Ryanair fly every day and a return flight is less than £100. 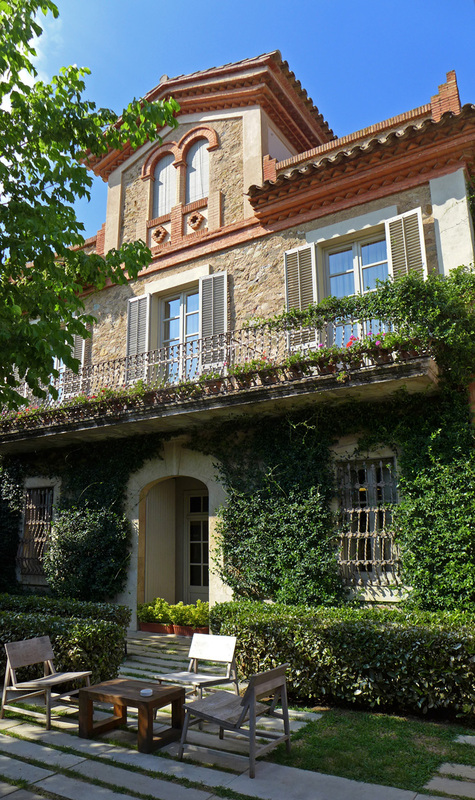 Transfers from Girona airport to the city are 35 Euro by taxi or 2.50 Euro by bus. The bus stops outside the terminal every 30 minutes and goes direct to Girona bus station. The hotel i booked was URH Girona and was £50 per night for a spotless room. Its 10 minutes walk from the bus station and also a 10 minute walk into the main city square. 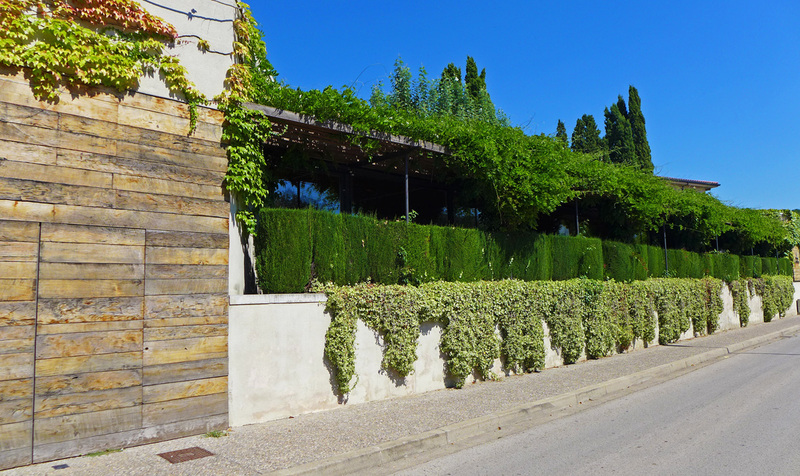 A taxi to Can Roca is 6 Euro or a 10 minute walk back when you`re absolutely stuffed….its basically just over the bridge from the hotel….ideally situated. I booked the restaurant for lunch simply because i wanted nice daylight colours for my foodie photos.It would also allow me to fit in more food later on that day….Cold Beer and Tapas. The first lunch tables are available at 1pm so i arrived early with my son Max for a look around the place and to settle in nicely. We were the only people in there apart from a camera crew so we chilled out on the big soft seating with an ice cold glass of house Cava . 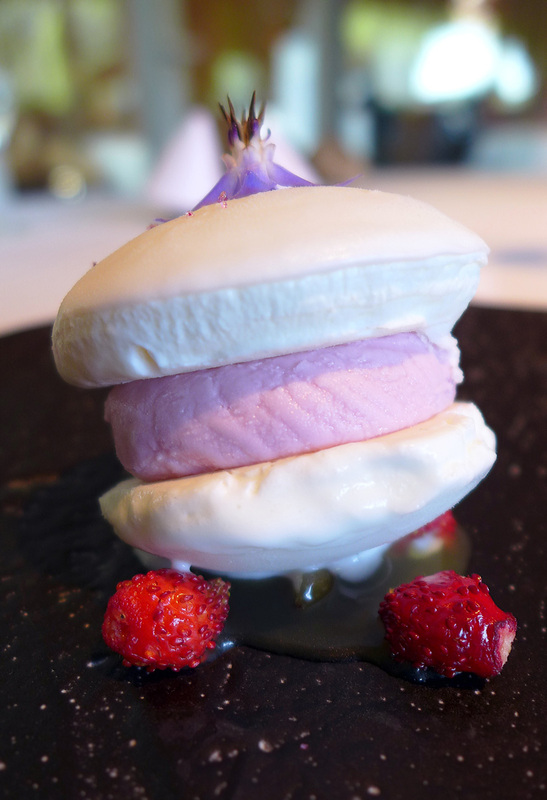 The whole of the premises are architecturally beautiful , a design masterpiece which extends to both the restaurant itself and the most high tech stunning kitchen ive ever laid eyes on. 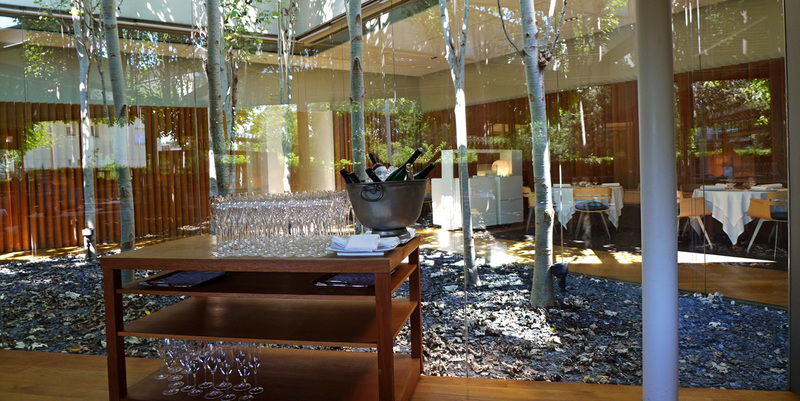 Huge glass walls , a mini plantation of what looked like silver Birch trees , Tunnels of pure White lead to the various areas of the restaurant and unique pieces of pottery and sculpture commissioned exclusively for the business. The whole set up is marvellous and the last thing one would expect to see in the middle of a residential area of Girona. The Price – For an establishment carrying such an exclusive honour the cost of eating here is very reasonable indeed. 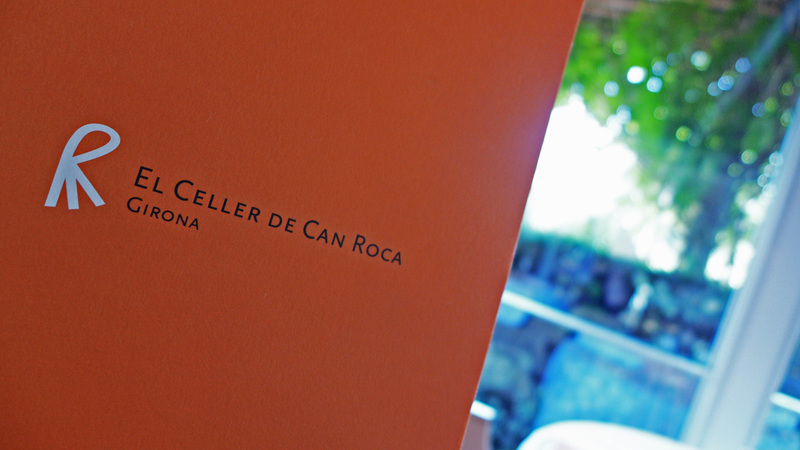 There are 2 menus at Can Roca and therefore only the 2 choices at both Lunch and Dinner. 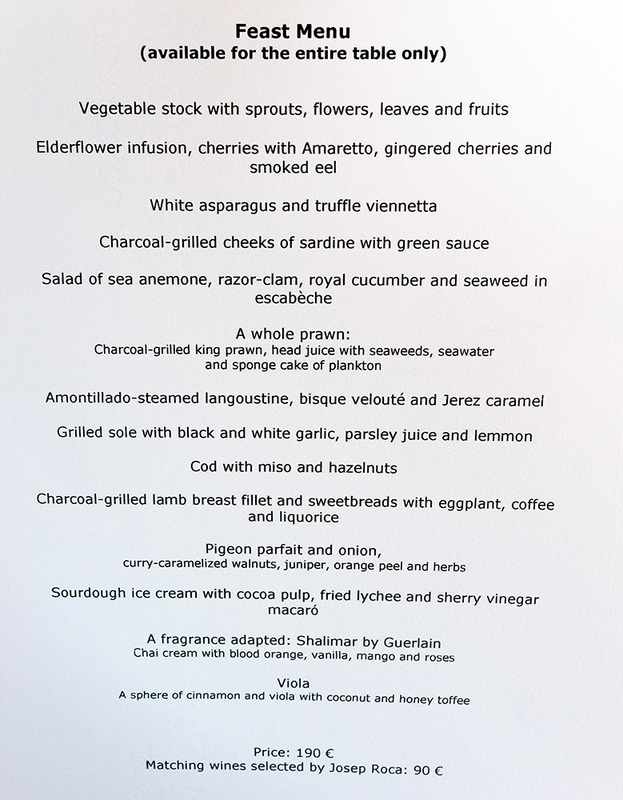 The signature menu will set you back 155 Euro and the menu that we went for cost us 190 Euro for the 22 courses. 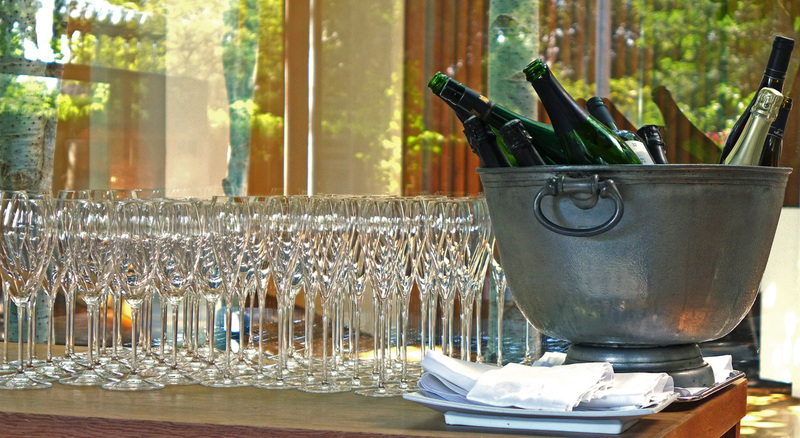 The total bill for the meal above with 2 glasses of House Cava , A wine flight of 13 carefully selected wines and 2 bottles of water was £ 440 . Rather less than that Olympic final and personally far more enjoyable. 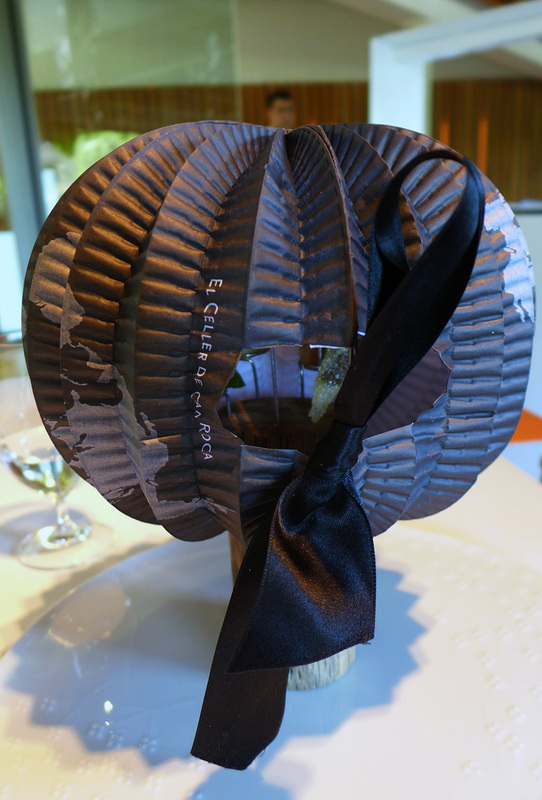 So our tasting menu begins with “The World” – A paper lantern representing the globe is dramatically opened up in front of the diner to reveal a mini planetarium of nibbles from around the World. 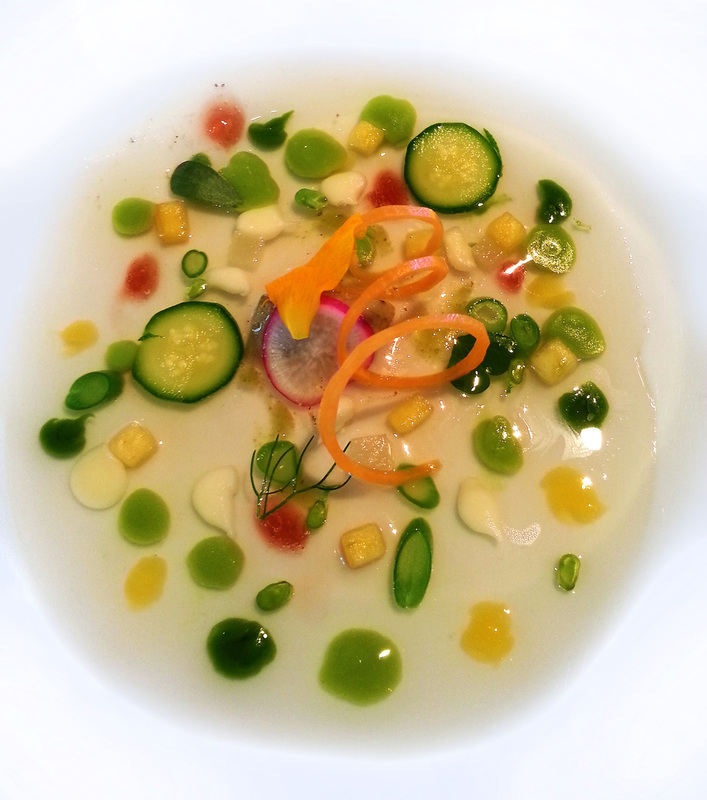 Mexico – Guacamole , Tomato seed , Tomato water and Coriander. – Designed to be eaten in one bite and contains an explosion of semi liquid Mexican flavours. 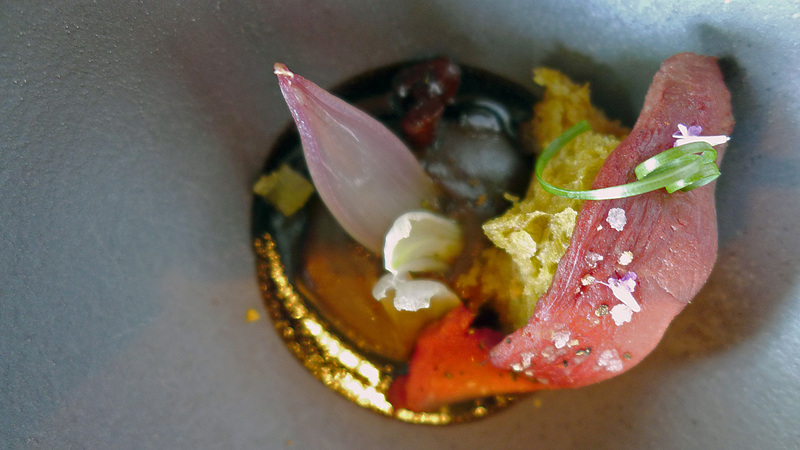 Peru – Ceviche broth – Once again , eaten in one bite and contained a liquid filling. 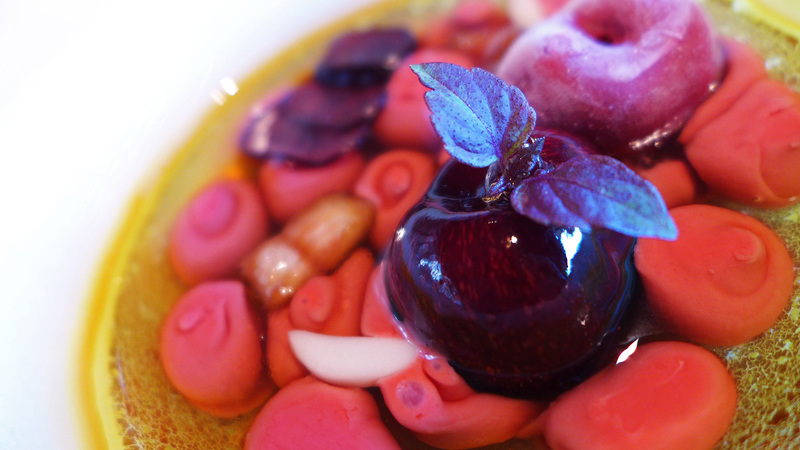 China – Pickled vegetables with Plum cream. 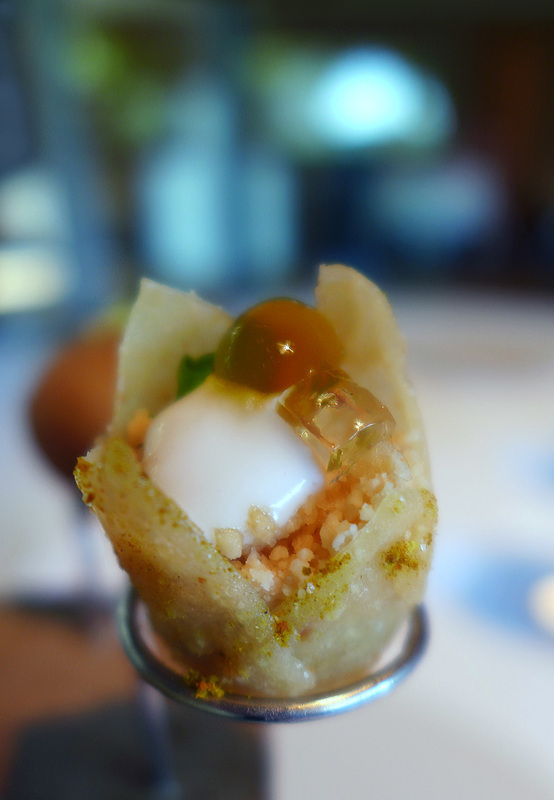 Morocco – Almond , Rose , Honey , Saffron , Ras el Hanout , Goats milk Yoghurt. 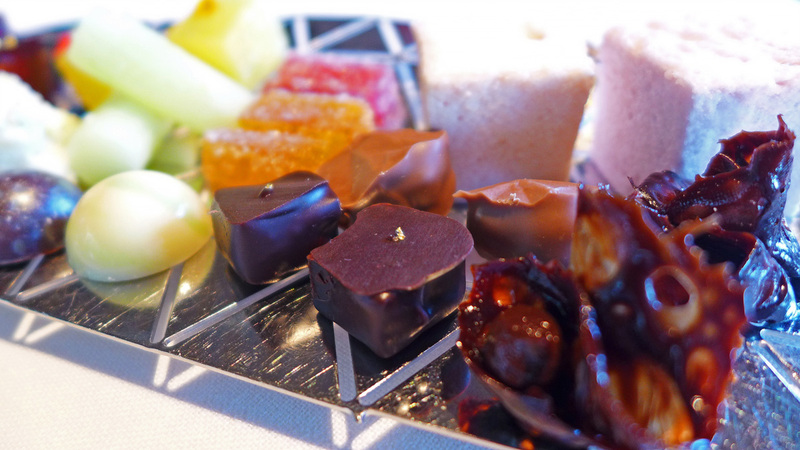 – Highly aromatic bite encompassing all the flavours of Morocco. This was a stunning flavour explosion. 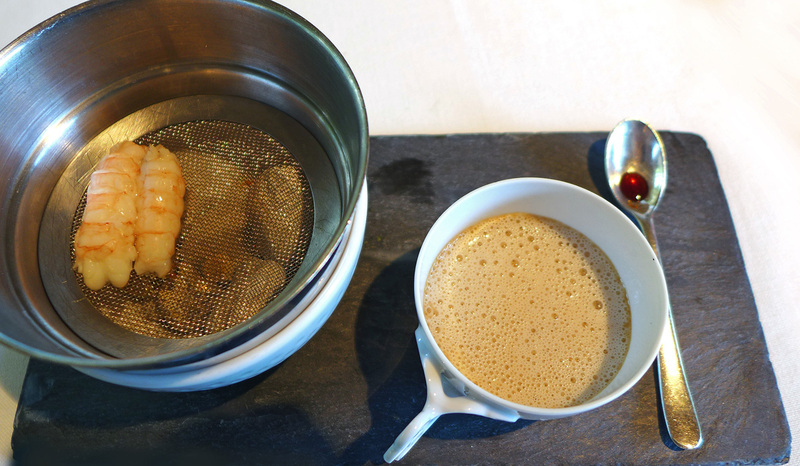 Japan – Miso , cream Dashi and Nyinyonyaki Tempura. 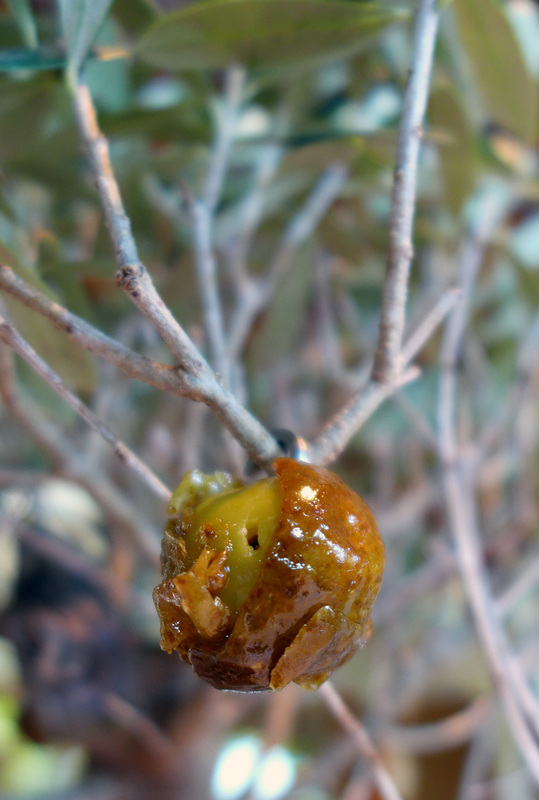 Caramelized Olive / Anchovy – This is a regular that the diner will always experience at Can Roca. 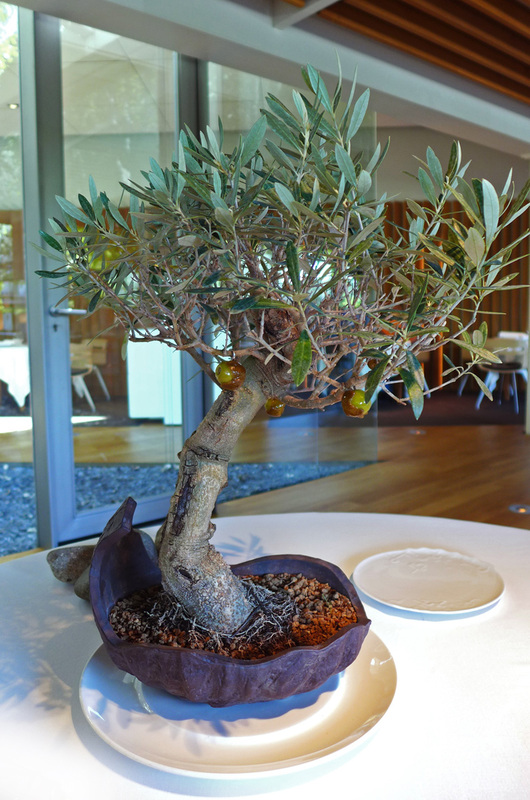 Real minature Olive trees with “pick your own” fruit hanging from the branches. 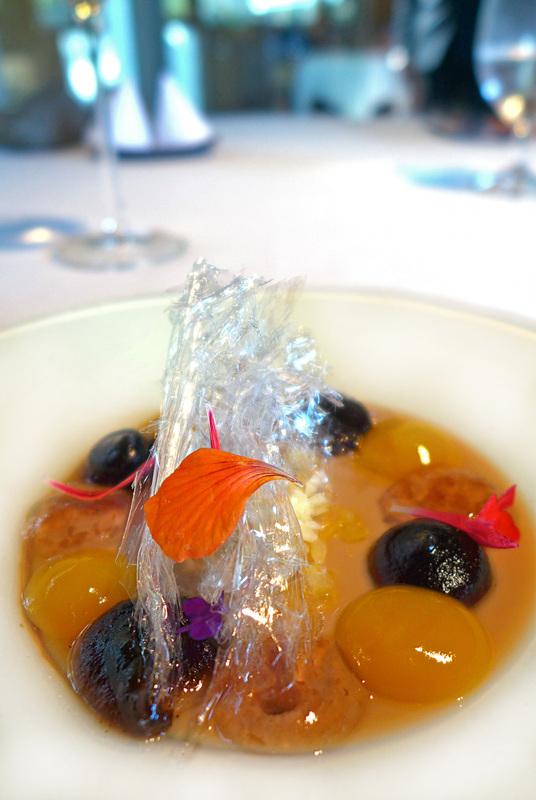 The olives were both sweet and salty being stuffed with Anchovy fillet and then encased in a wrapping of Caramel…. certainly different and raised a smile. 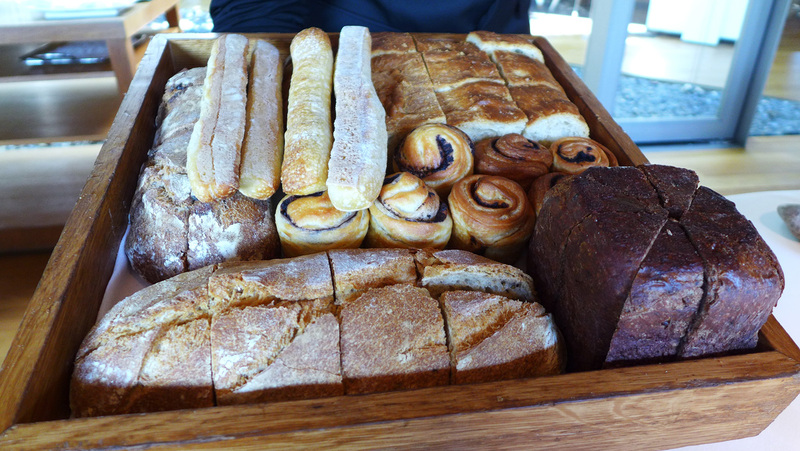 A nice selection of freshly baked Can Roca breads. 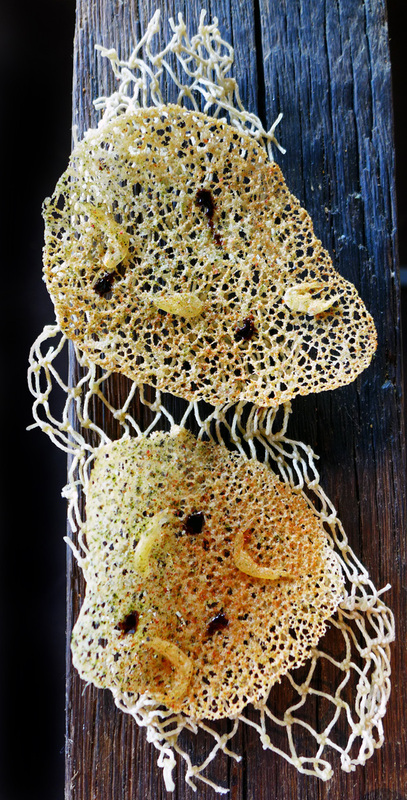 Crispy Shrimp – Little wafers on a fishing net . I`m not entirely sure what the seasonings were on these but if you look closely then you`ll notice the tiny shrimps and various sprinklings. 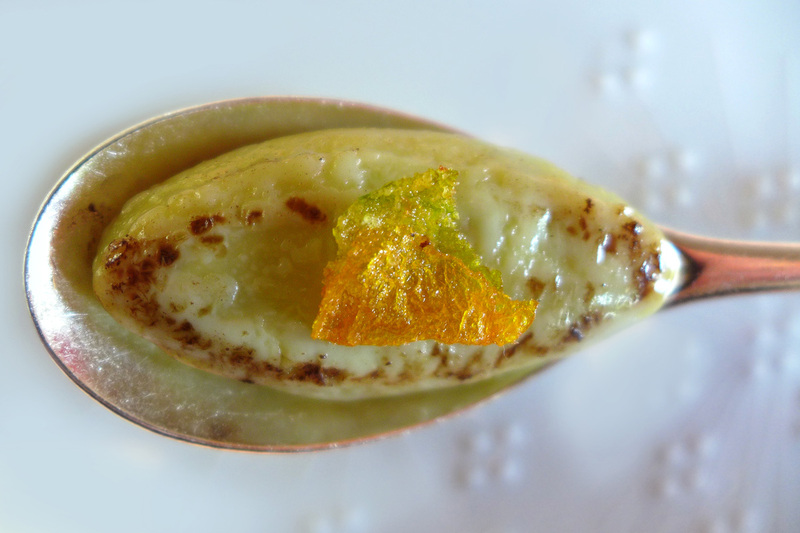 Carpano bonbon with Grapefruit and Black Sesame – Basically a crisp shell with a Vermouth liquid filling , not a show stopper and gone in a bite. Zucchini Omelette – A miniature delight containing a semi liquid filling. 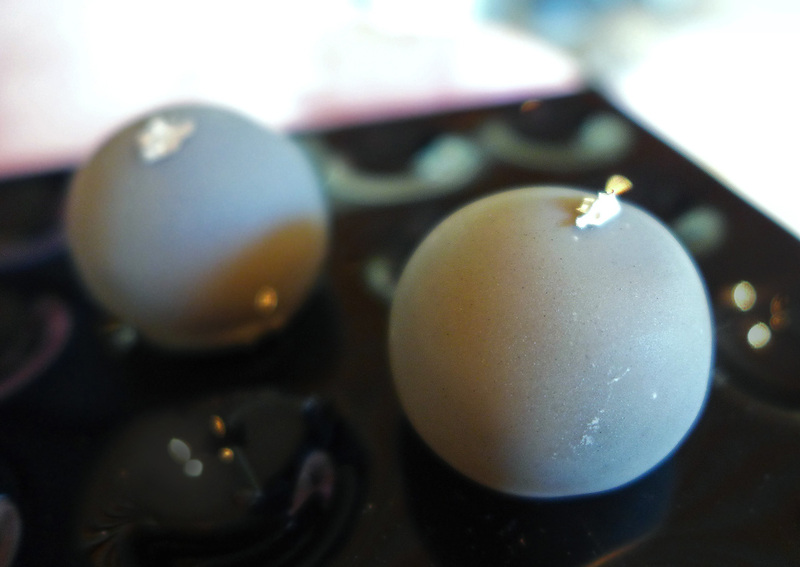 Truffled bon bon – Stunning and very realistic looking with an amazing burst of Truffle flavour. 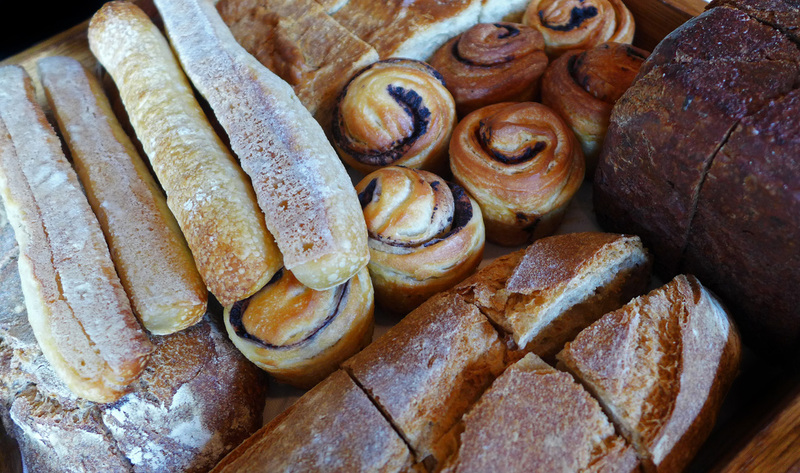 Truffled Brioche….soft , sensuous and heavenly flavour of Truffle. Dont ask me how they moulded that silver baseplate off a slice of Bread . 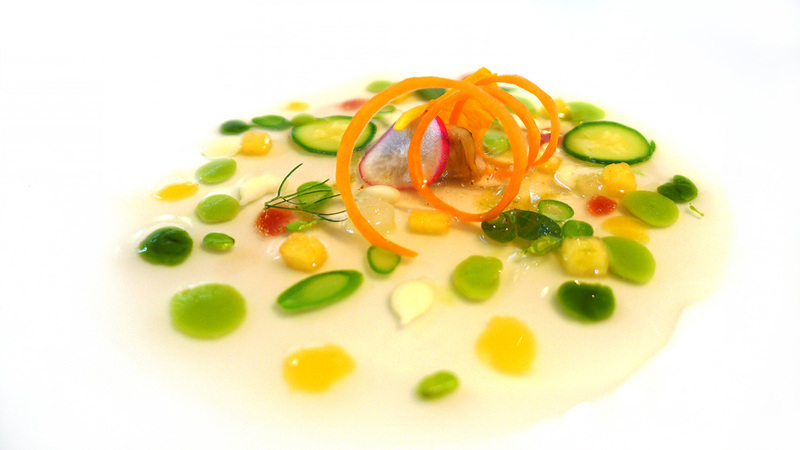 Vegetable stock with sprouts , flowers , leaves and fruits. 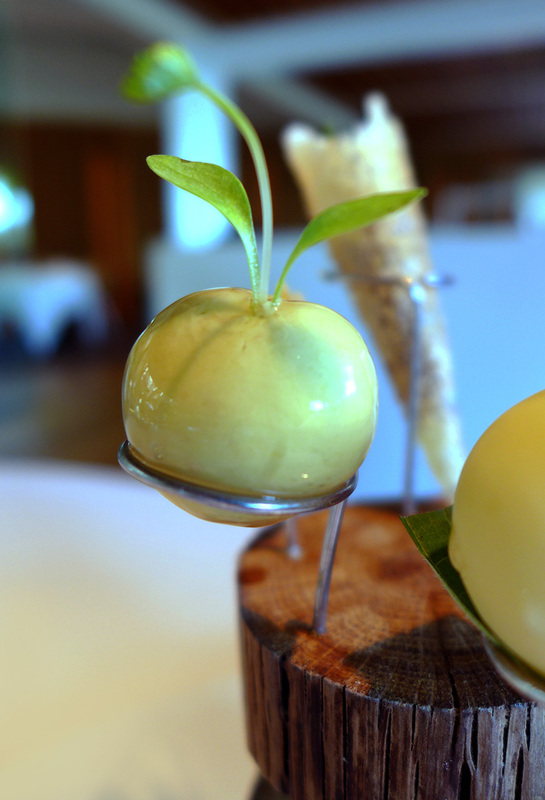 – Very pretty , subtle and fresh flavours of Summer. 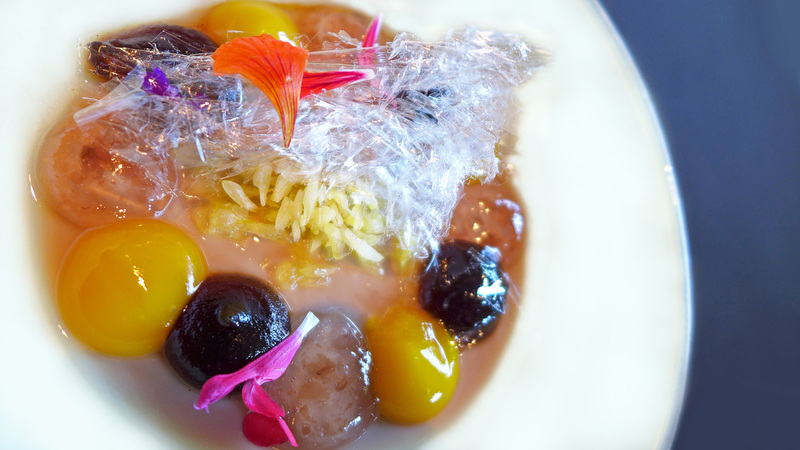 Elderflower infusion , Cherries with Amaretto , Gingered Cherries and Smoked Eel. 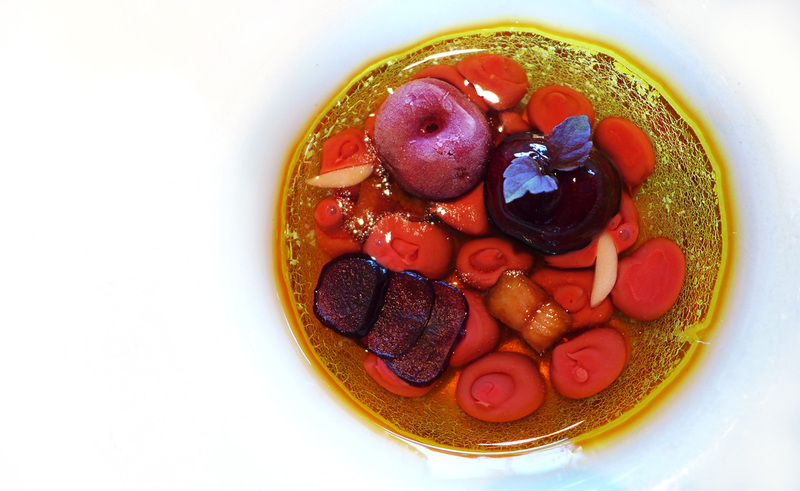 – Cracking dish with a heavy Cherry flavour. 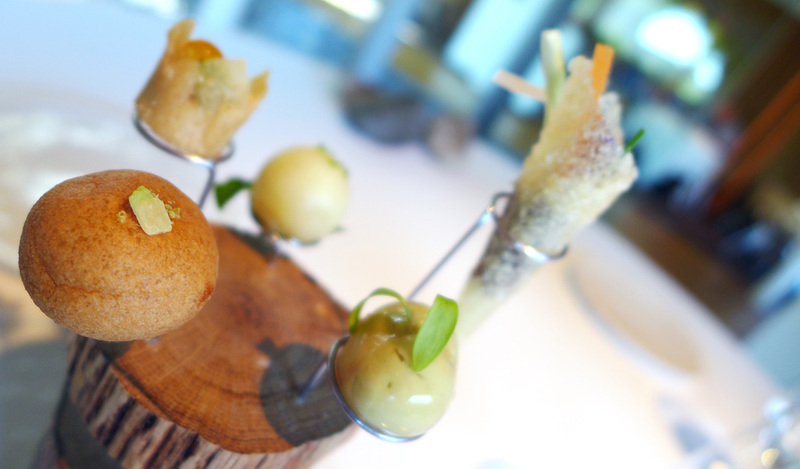 Little bites of Smoked Eel to bring a very slight savoury transformation to what would have otherwise been a divine dessert. The Cherry was magically filled with a Ginger ice cream and then frozen. 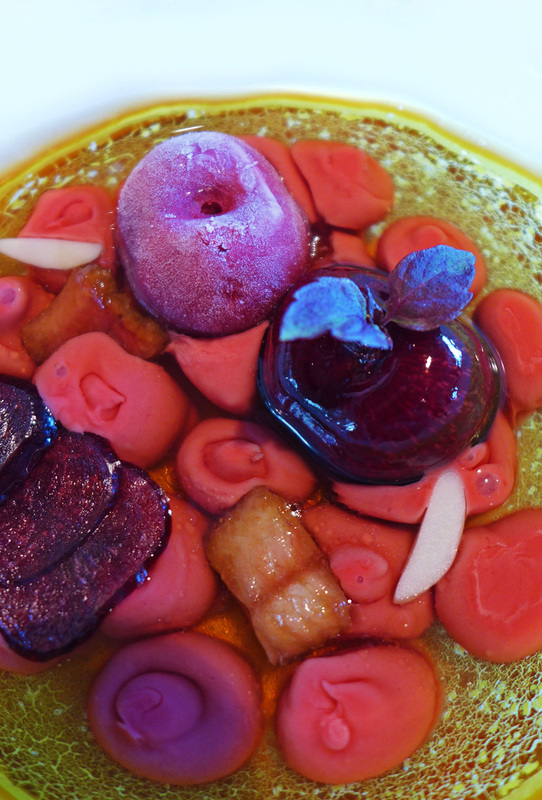 Cherry gel was piped into the Cherry consomme liquid once it had been plated up. One of the stand out courses of the meal. 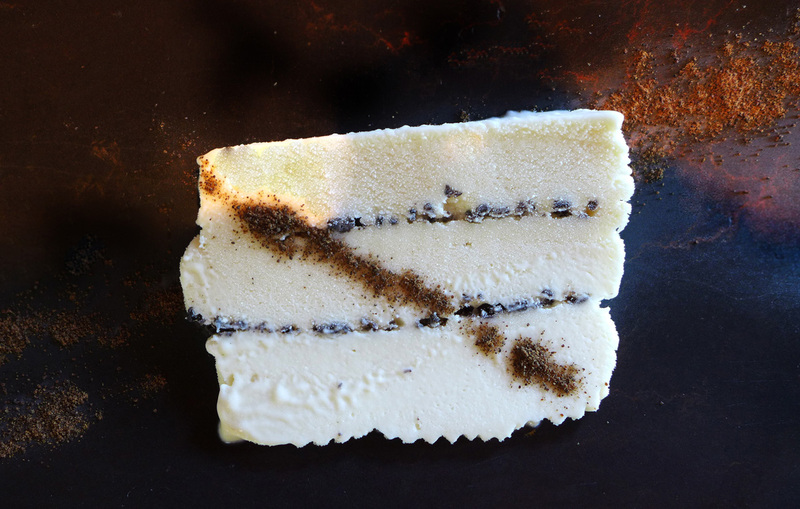 White Asparagus and Truffle Viennetta. – Nice little take on the classic ” Walls Viennetta ” but it didn`t work for me as i`m not into my ice cream tasting of Asparagus. 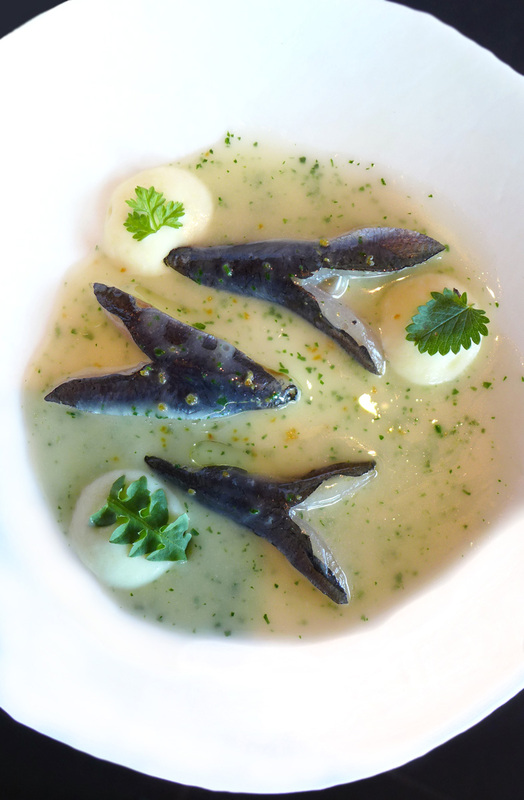 Charcoal grilled Cheeks of Sardine with Green sauce. – Ohh dear , this was the worst taste experience ive had in a long time. 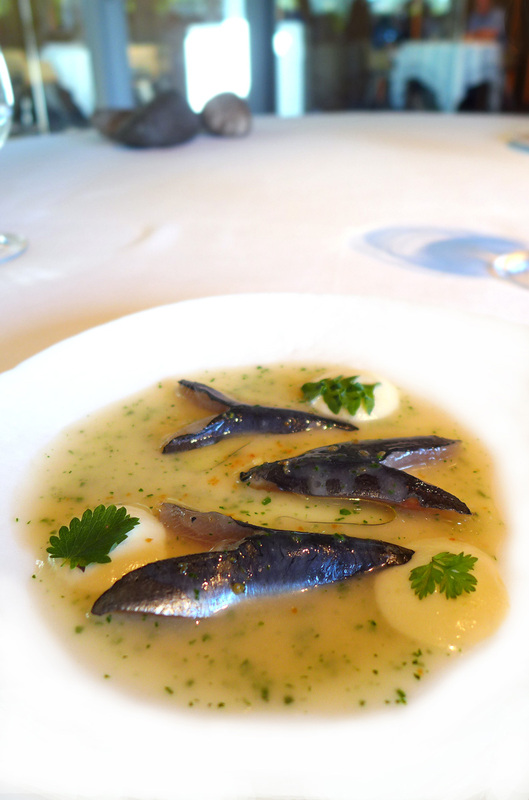 Semi raw sardines on a sauce that tasted of “not a lot “. My son Max took one bite and turned White….” Im really sorry Dad , i can`t eat this “… ” Max….. you can`t leave a full plate of food , just try some more”. Then i tried my own…….. Ahhhhh , i see what you mean. Enough said. 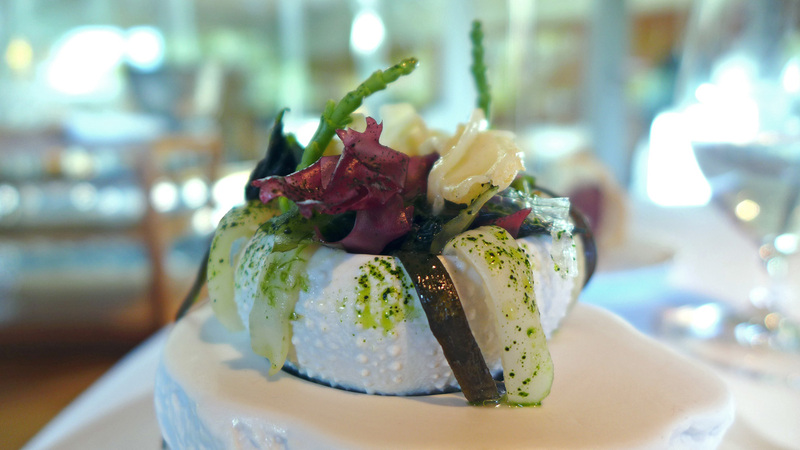 Salad of sea Anemone , Razor Clam , Royal Cucumber and Seaweed in Escabeche. 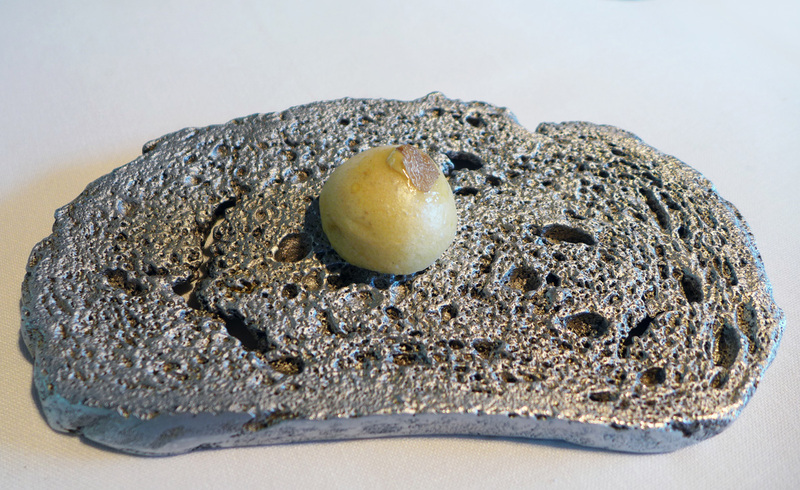 This one reminded me a little of the flavours of Heston Blumenthals ” sound of the sea” a highly technical marriage of Ocean flavours and textures. 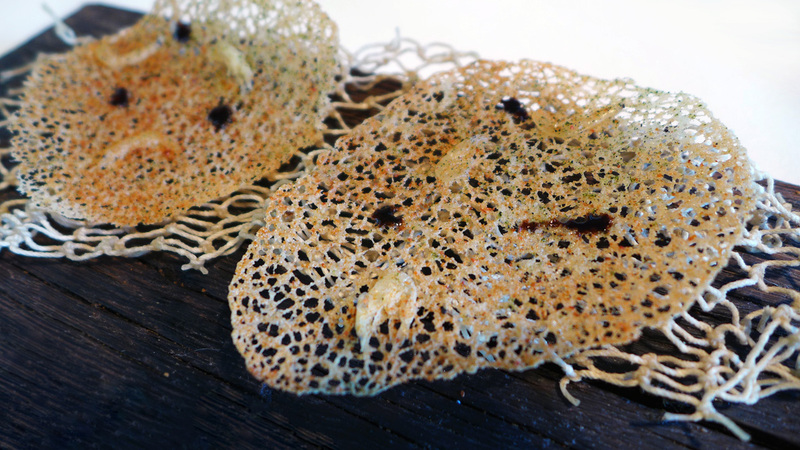 Clean tastes , very fresh seafood flavourings , a sauce in the bottom of the shell made from the juices and edible seaweeds. A stand out course and one of my favourites. 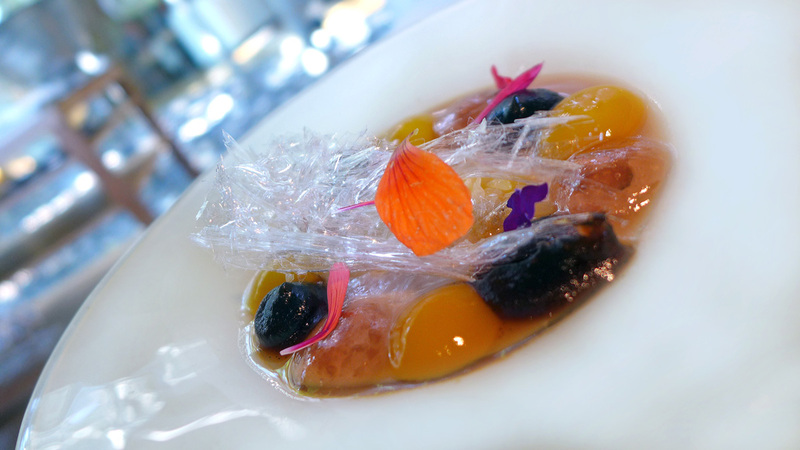 I think a mistake was made in the wording of this dish .. Sea “Anemone” should have been ” Urchin” as i wasn`t aware that the former were edible….correct me if i`m wrong folks. 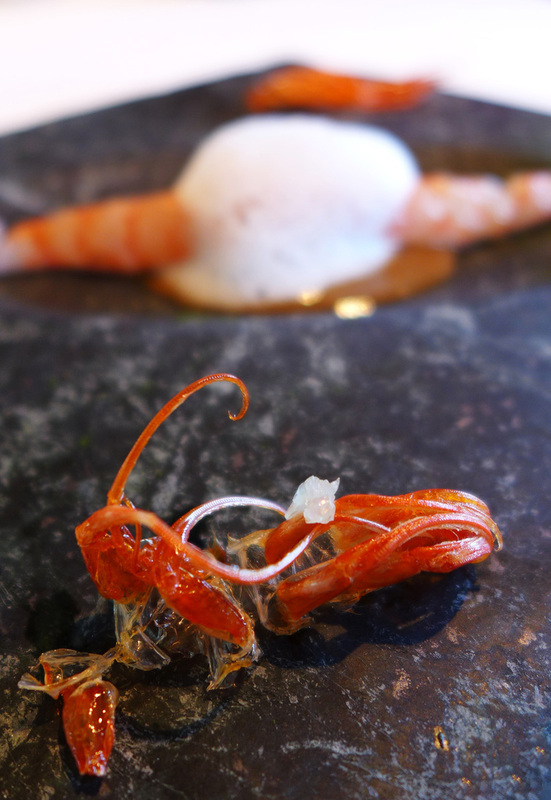 “A whole Prawn” – Charcoal grilled King Prawn , head juice with Seaweeds , Seawater and Spongecake of Plankton. 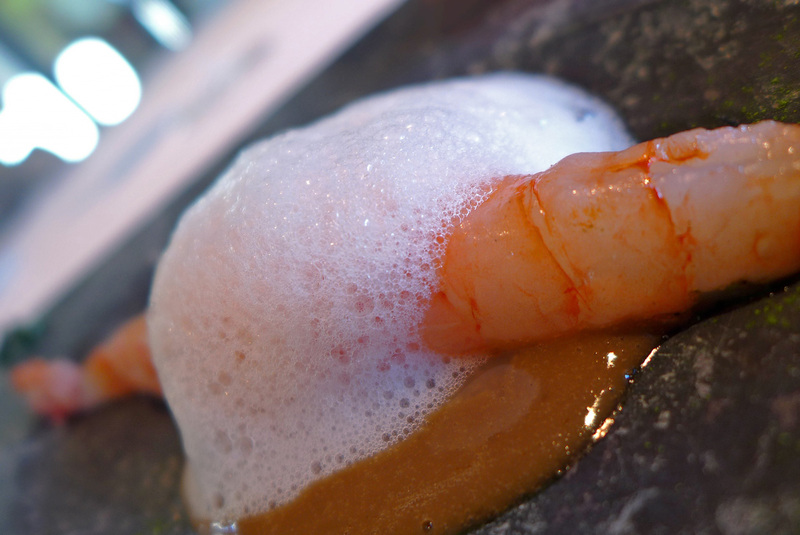 – Barely cooked and very soft , sweet Palamos Prawns presented with their “Head Juices”. 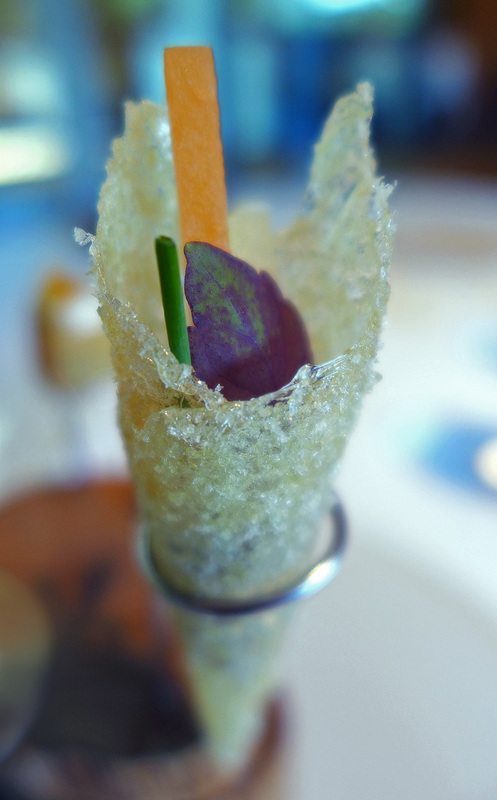 Nice flavours here and the highlight for me was the Crispy legs and carapace. 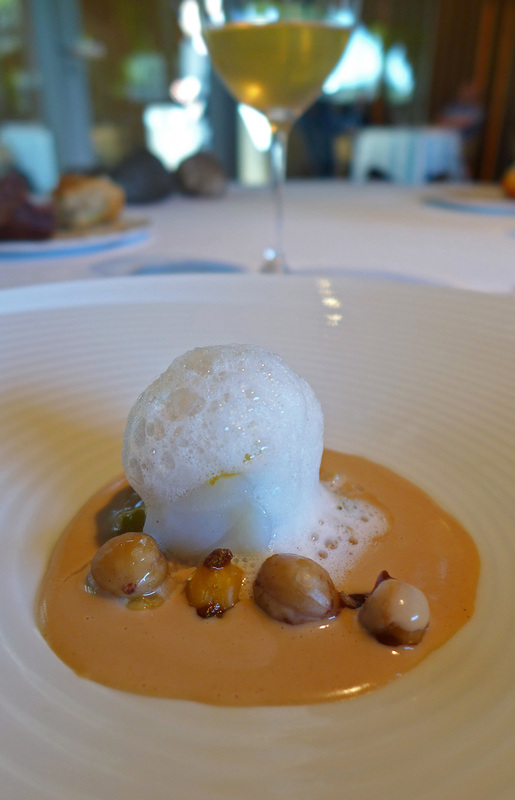 Palo Cortado steamed Langoustine , Langoustine bisque veloute and Jerez Caramel. Another highly flavoured Shellfish dish. 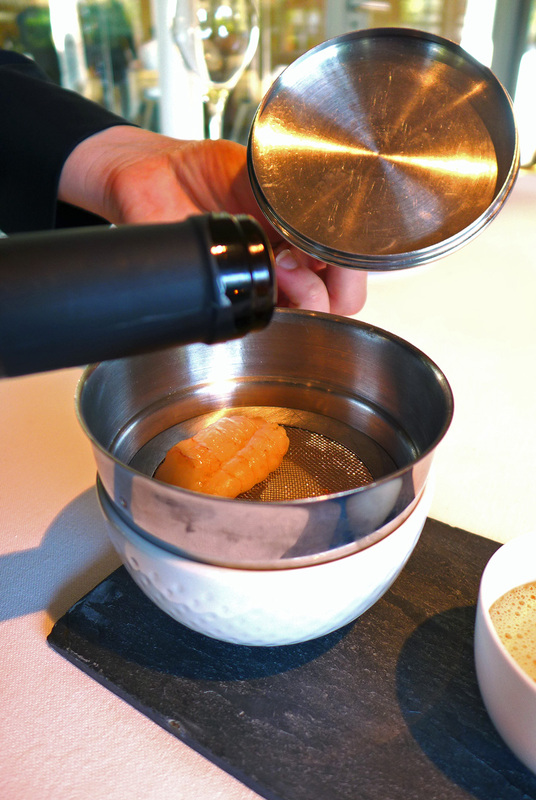 One Langoustine was presented over a piece of hot Charcoal , swiftly doused in a Sherry and the lid replaced. 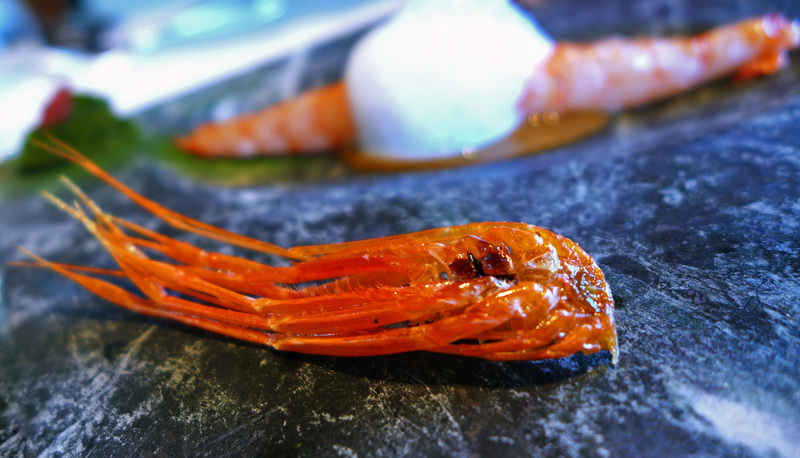 Served with a Bisque created from the Langoustine shells and finished off with a `drop` of liquid Jerez Sherry Caramel on a spoon. Nice rich dish and i could have eaten a dozen of these. 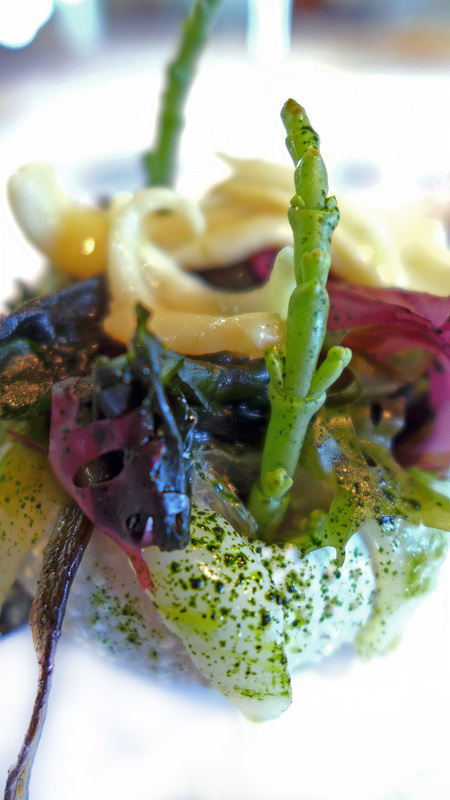 Grilled Sole with Black and White Garlic , Parsley juice and Lemon. 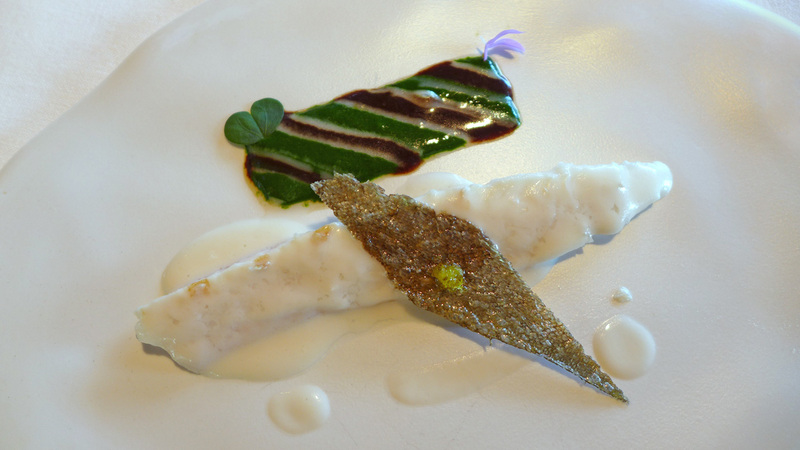 – Very fresh and extremely delicate piece of snow white Sole. 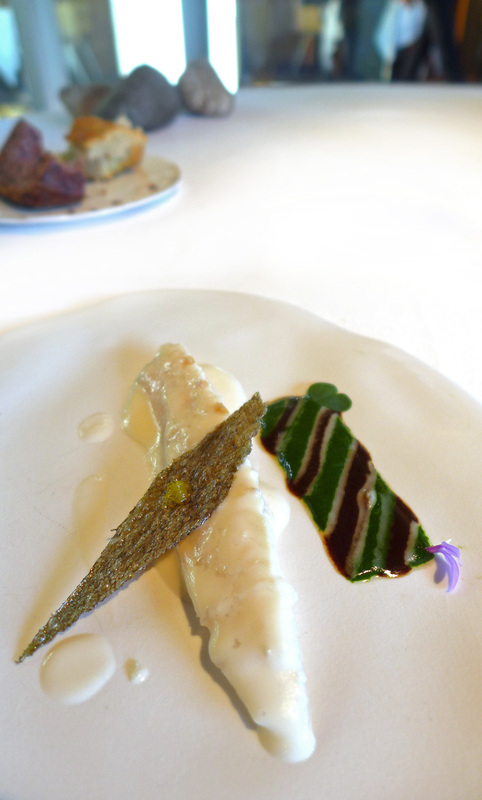 with a beautiful creation of accompanying sauces, Looked great but at the end of the day it was a piece of fish with a very light bathing of sauce. 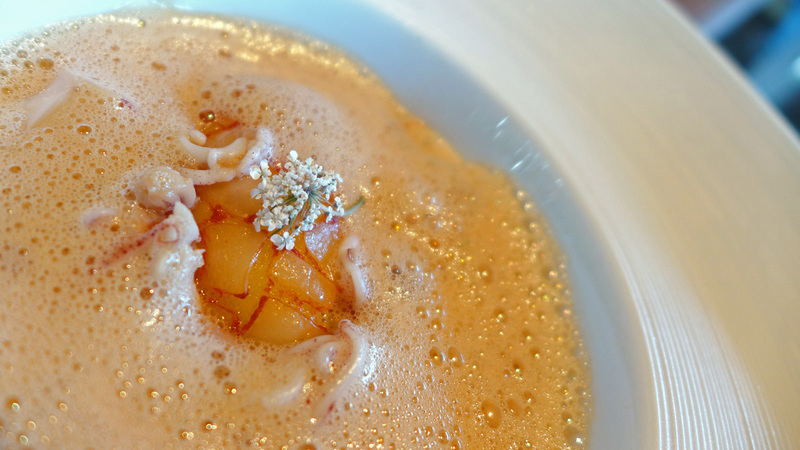 Calamari parmentier with smoked Paprika and Calimari broth. 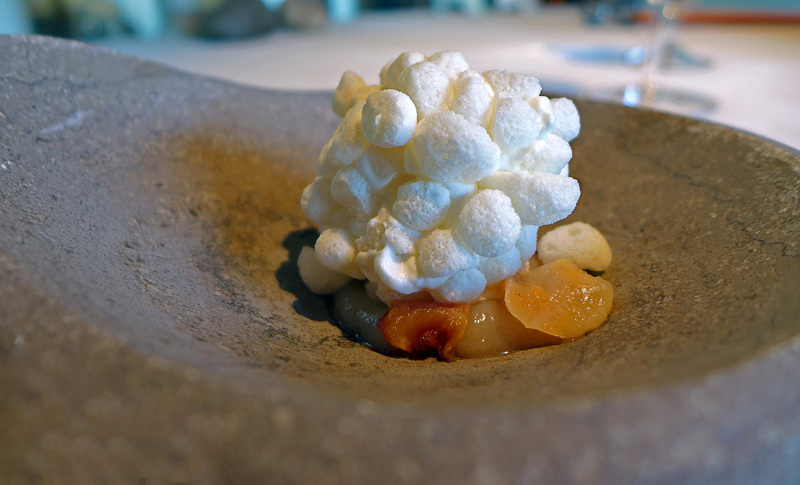 This was my sons and an alternative dish to my course as it contained Hazelnuts. 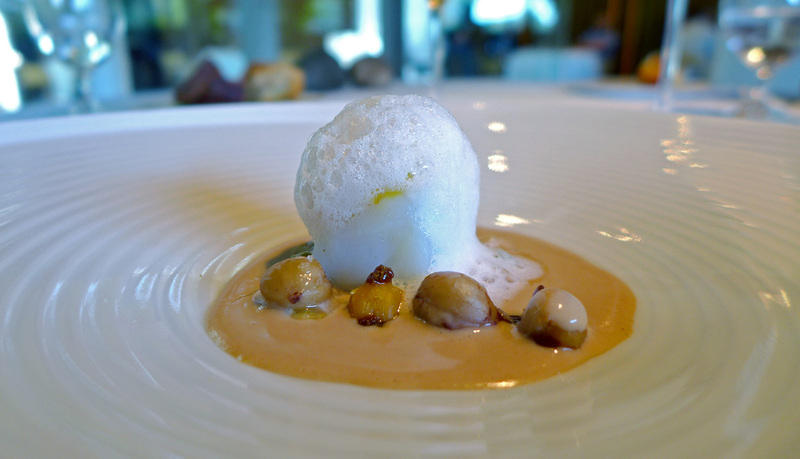 Cod with Miso and Hazelnuts. 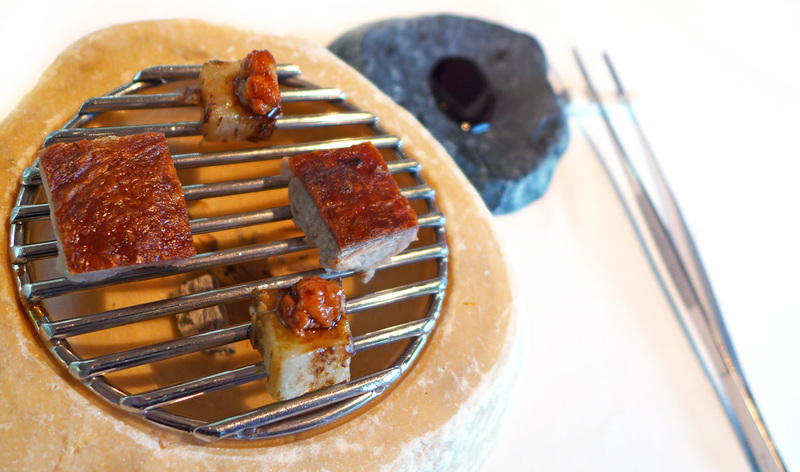 – Perfectly cooked little square of Codfsh with fresh Hazelnuts. 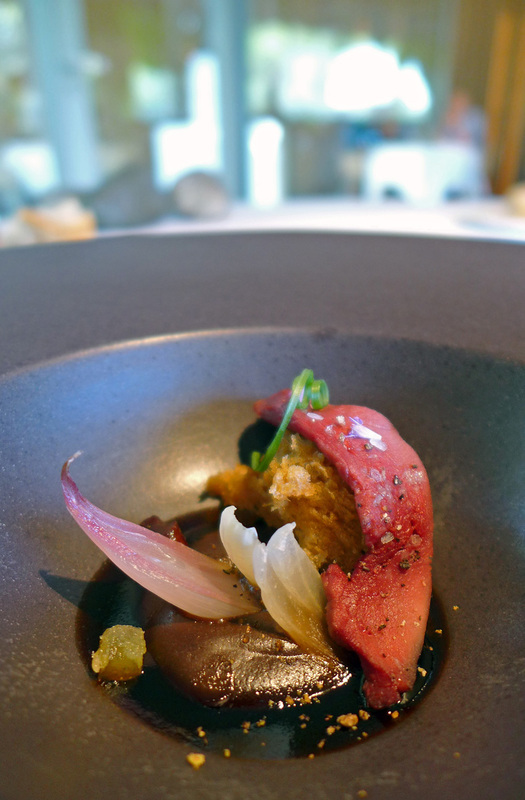 Charcoal grilled Lamb breast fillet and Sweetbreads with Eggplant , Coffee and Liquorice. 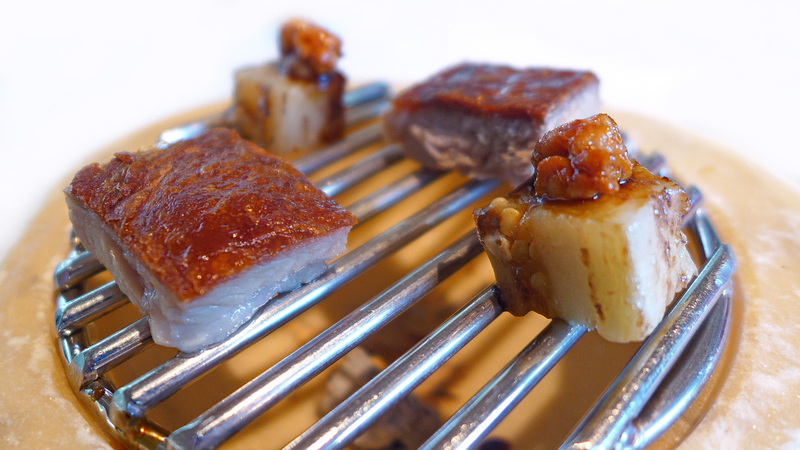 – Beautiful ” two” bites of heavely flavoured Lamb breast coated in a laquer of Lamb reduction scented with Coffee and Liquorice. 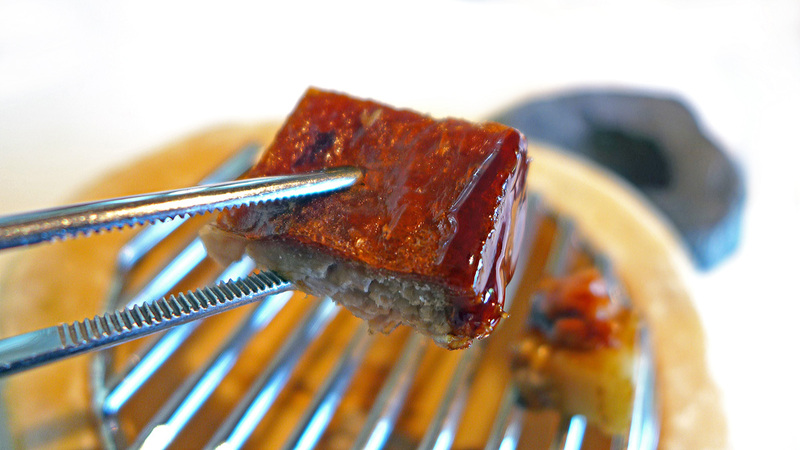 Crisp skin , soft smokey meat and the most amazing dipping sauce….Sat above glowing embers but only the 2 bites , i could have eaten a full plate of this wonderful food. 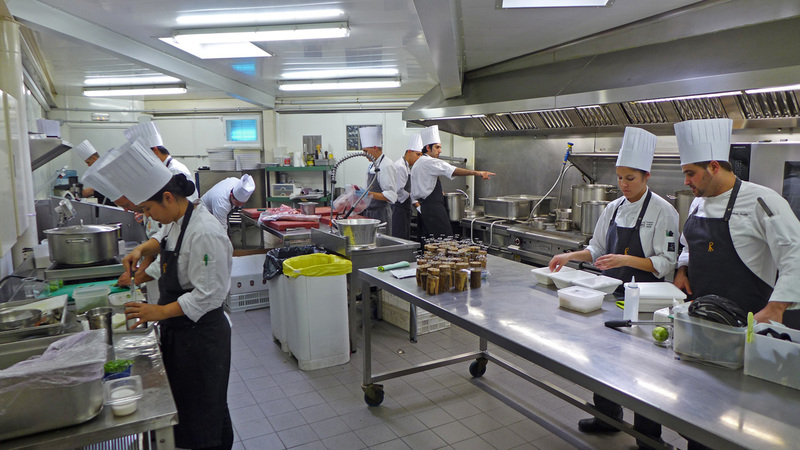 Before we started on the desserts we got a good look around the kitchens. It was so modern , clean and housed all the latest technology. 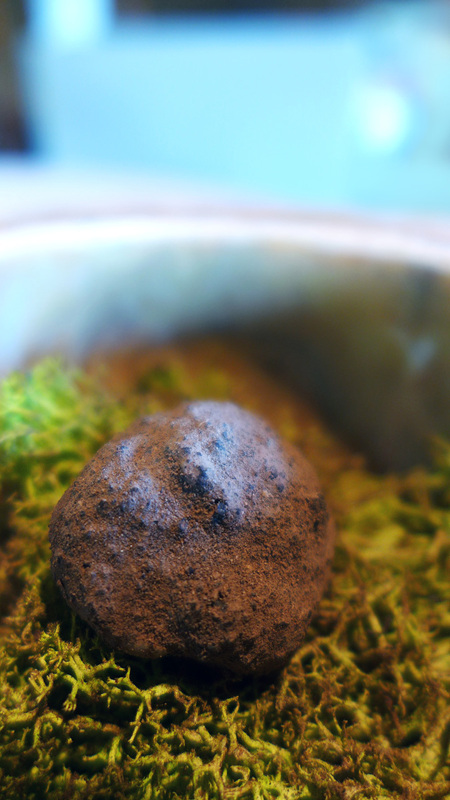 Sourdough ice cream with Cocoa pulp , fried Lychee and Sherry vinegar Macaro. 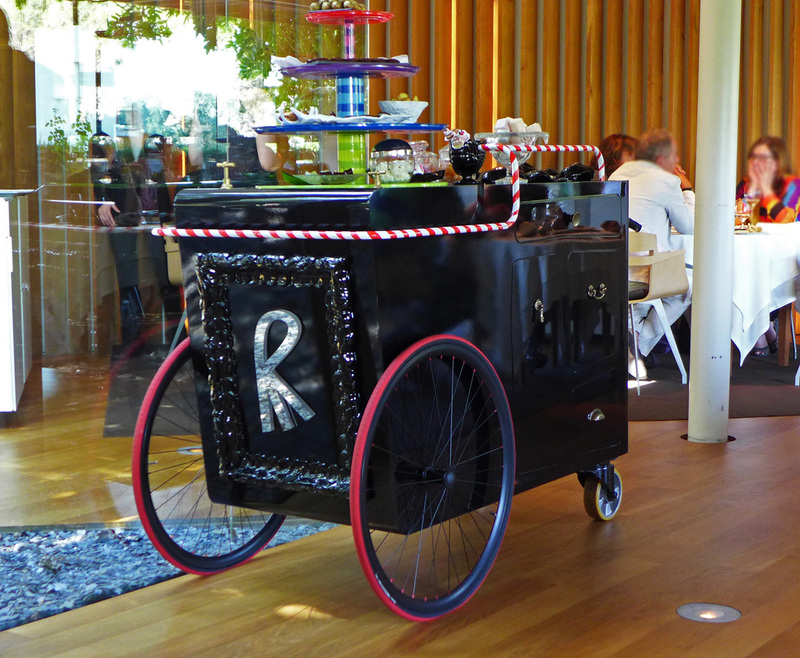 – A Jordi Roca creation and an introduction to more sweet treats. A fragrance adapted ” Shalimar by Guerlain ” – Chai cream with blood Orange , Vanilla , Mango and Roses. 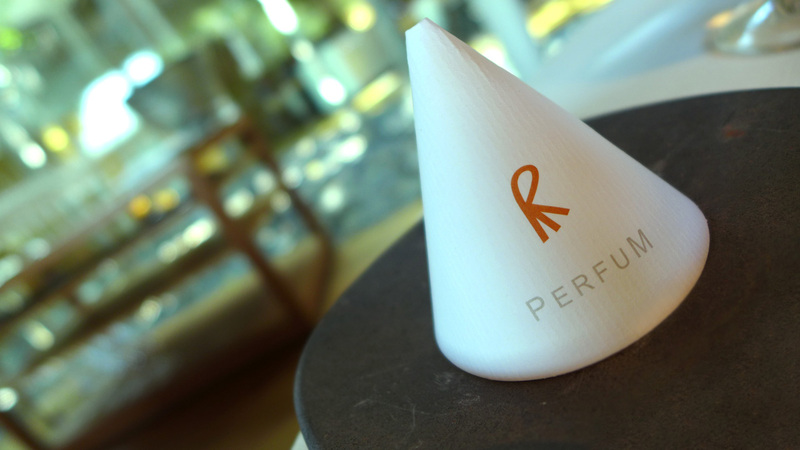 – This dessert came with a small cone with the words ” Perfum ” printed on it. We were instructed to eat the dessert and then sniff the cone.Ahhhhh , all becomes clear , a very clever breakdown of the components of Shalimar perfume laid out on a plate. 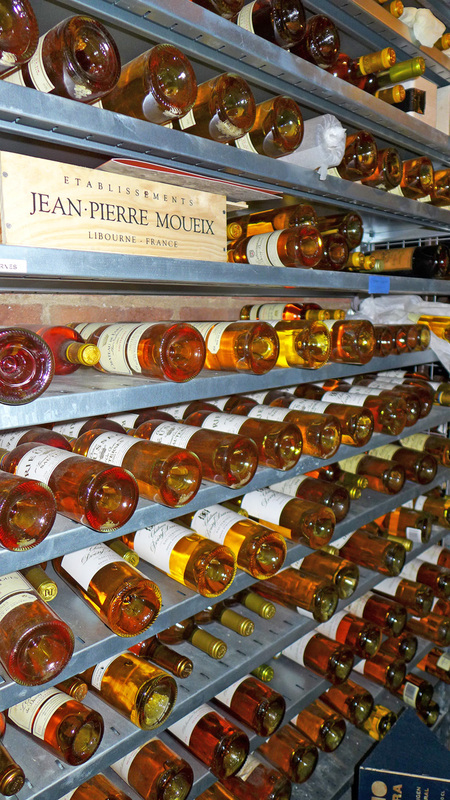 Jordi Roca had certainly researched this one well as they matched up exactly. I found myself sneaking a few sprays of Shalimar on the Guerlain stand in Girona airport duty free shop…..Heaven scent. 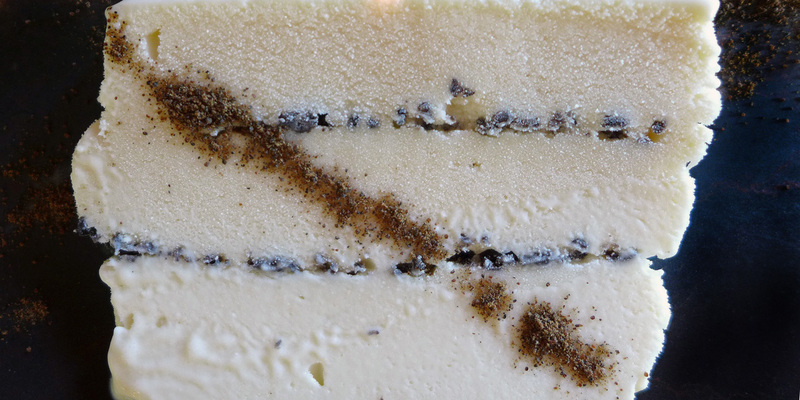 Viola – A sphere of Cinnamon and Viola with Coconut and Honey toffee. 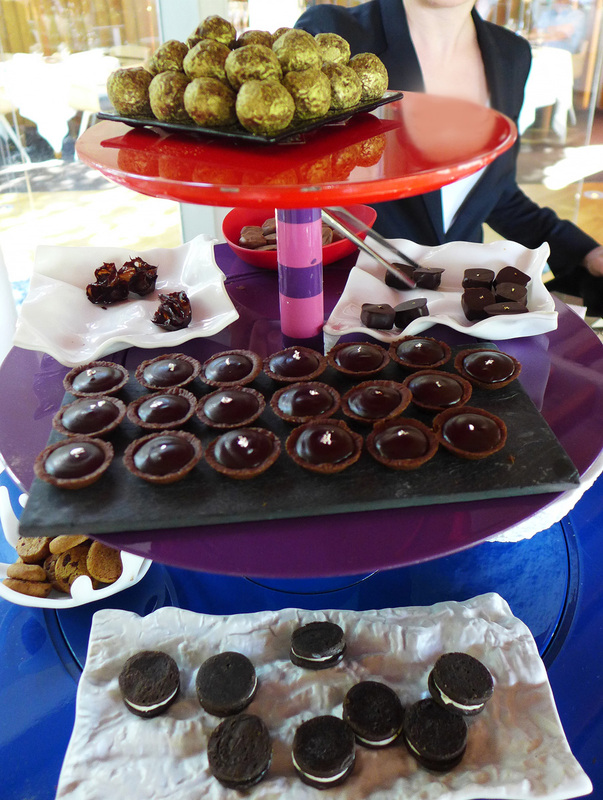 – I`m definitely a dessert freak , i could have eaten Jordis creations as a tasting menu on their own. 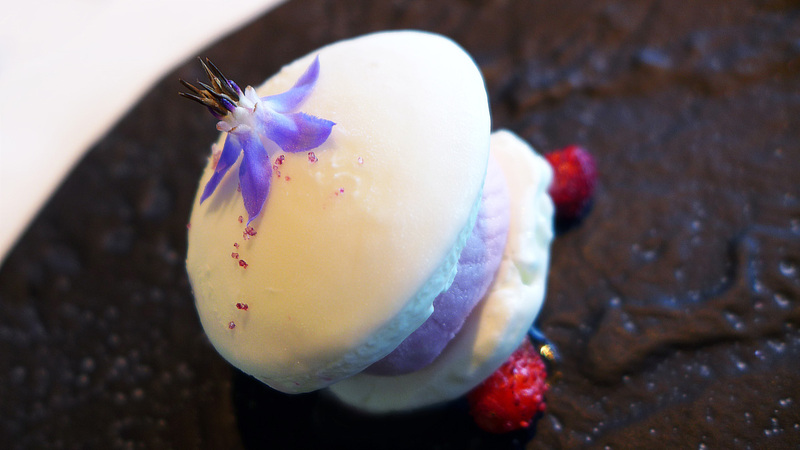 Violet ice cream ,WOW. 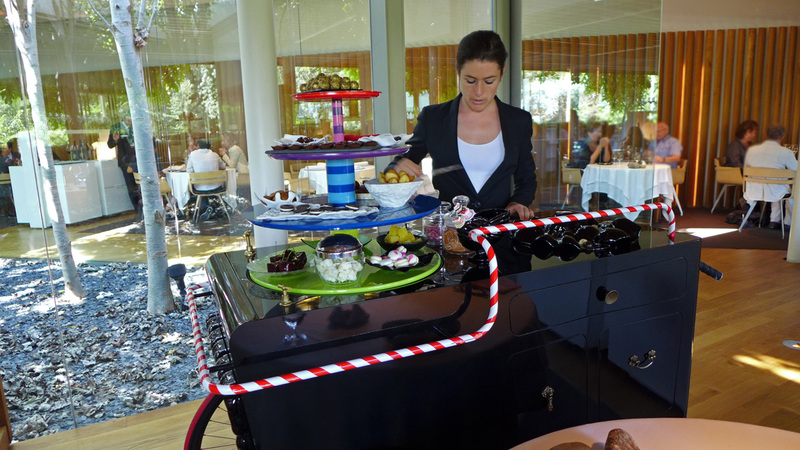 The Sweet trolley with Espresso. – This was just a case of ” How many can you eat ” …i could have eaten the same amount again. So to sum up my feelings on the `Worlds best restaurant`… well it`s definitely each to their own.One mans meat is anothers poison and all that. 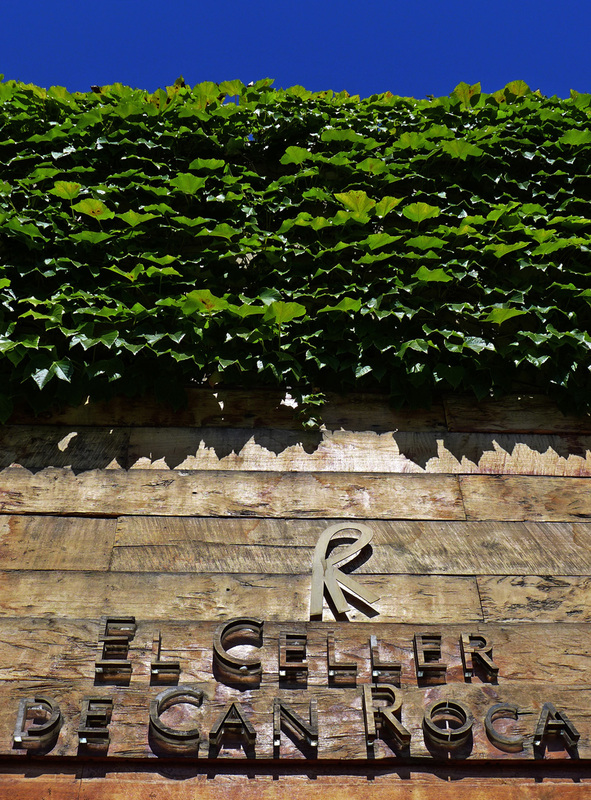 It was an enjoyable experience and i`ve now been to El Celler de can Roca, bought the T-shirt and seen the show. 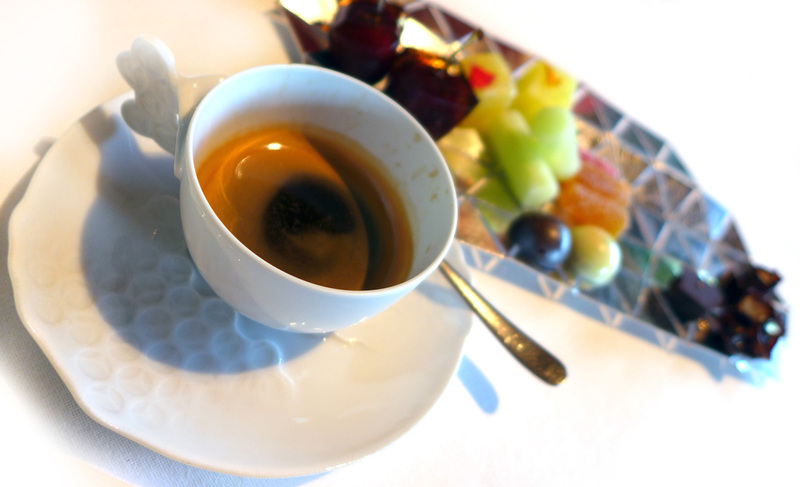 In my eyes it`s definitely not the best meal i`ve eaten by a long way. 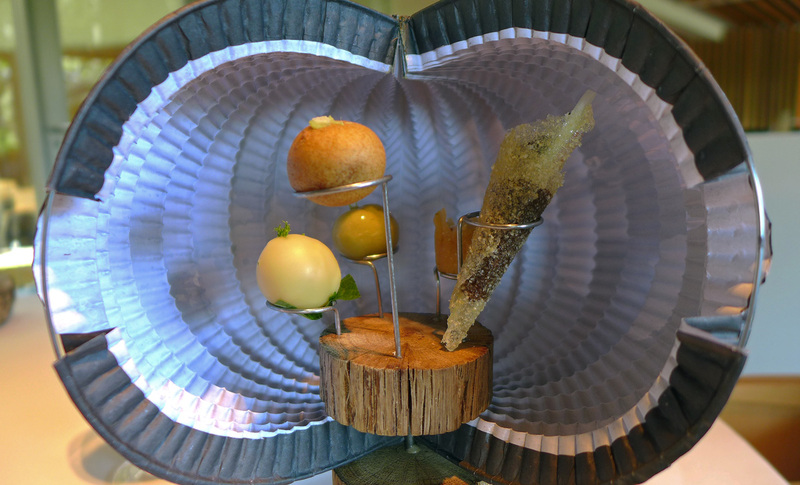 My Fat Duck experience ( HERE ) embodied so much more creativity and glamour. Hestons food was extremely theatrical and technical the likes of which `joe public` could never ever recreate at home. ( i did try – HERE ). 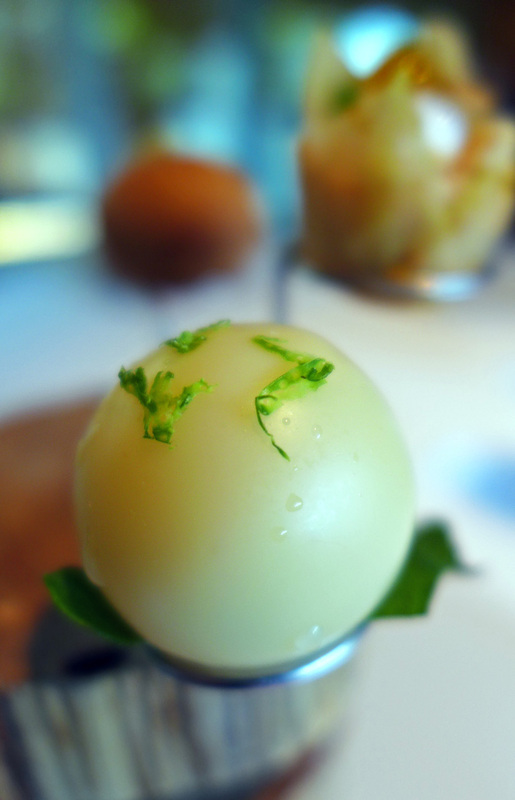 Dominic Jacks food at Castle terrace, Edinburgh , my best meal of 2013 was confident and technical cooking to the highest standards of competance. 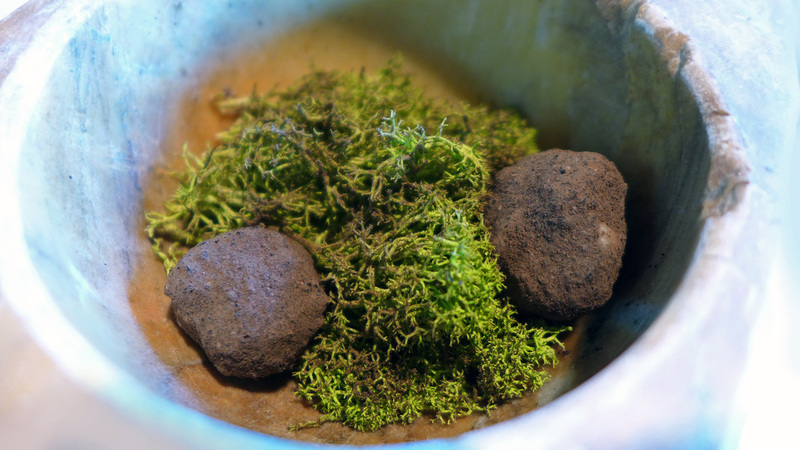 ( HERE ) Then there`s Simon Rogan at Lenclume ( HERE ) , the next UK 3 Michelin star restaurant in the making offering a totally unique meal in beautiful surroundings the likes of which you`re not going to get anywhere else in the UK. 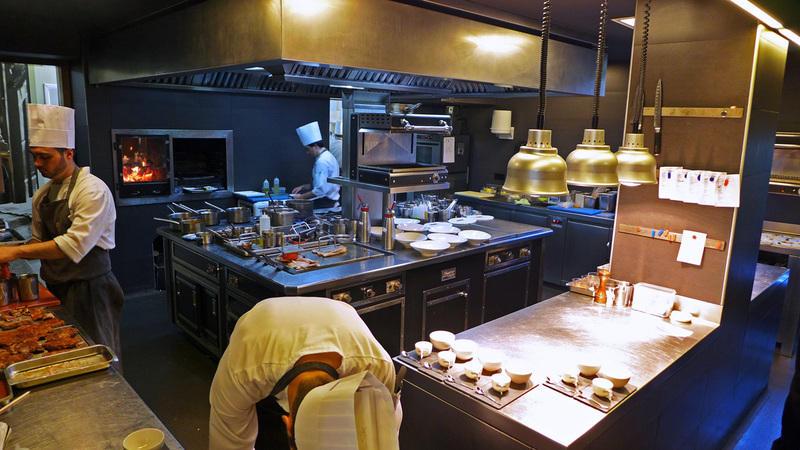 So there`s 3 restaurants which i would all put above the food of Can Roca…….But just to stress….”in my own opinion” .It`s a good job we`re all made differently or the food world would be a pretty boring place. 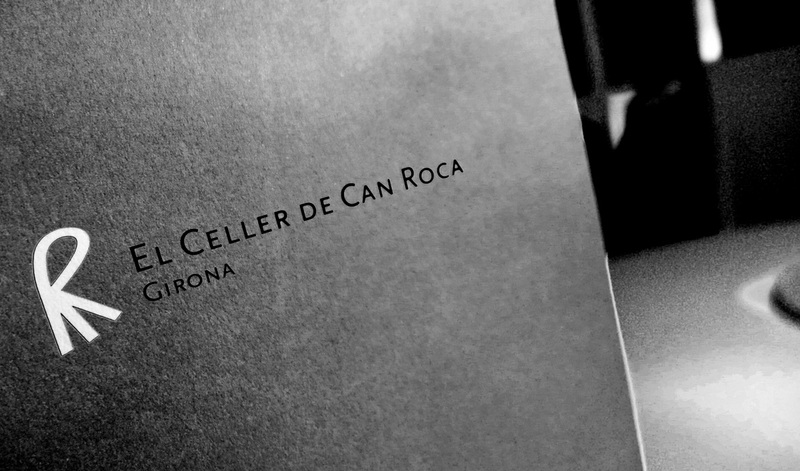 El Cellar de can Roca is definitely worth the trip , especially when it can be combined with the likes of my amazing meal at Massana the following night ( next blog post ). The food will delight some and not others but no one will leave the place disappointed. 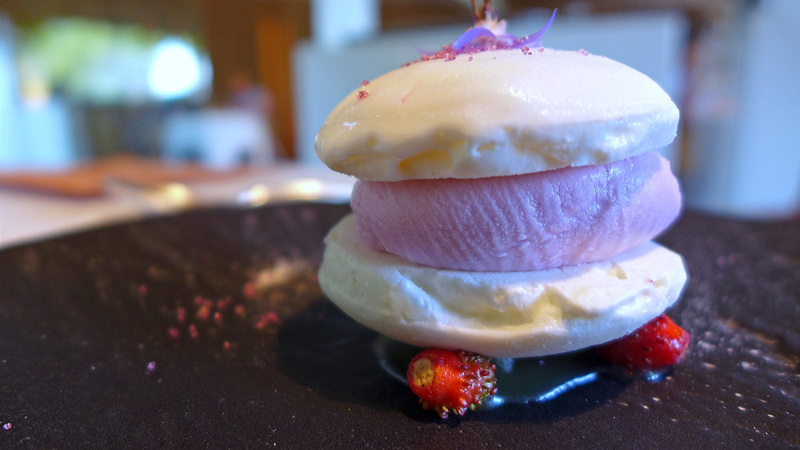 Its a tick in the box for the foodie traveller that has to be checked off. 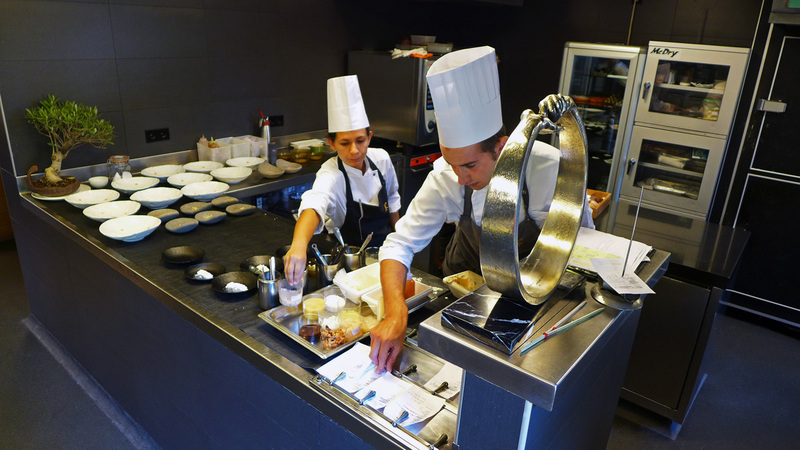 My biggest let down at Can Roca was the service. It wasn`t personal in any way , shape or form . It was very refined , silent, orchestrated and distant. No smiles and no personal touch like The Berkeley or The Ritz ( HERE ) , It was business only and i found it to be very cold and impersonal.. 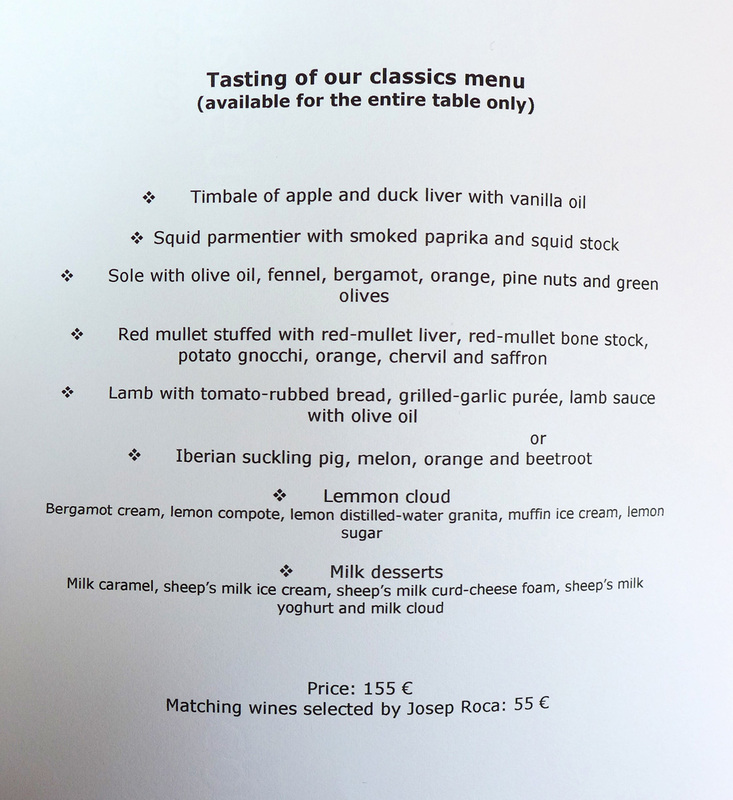 I met Josep Roca as he passed around the tables , lovely guy , both quiet and unassuming. 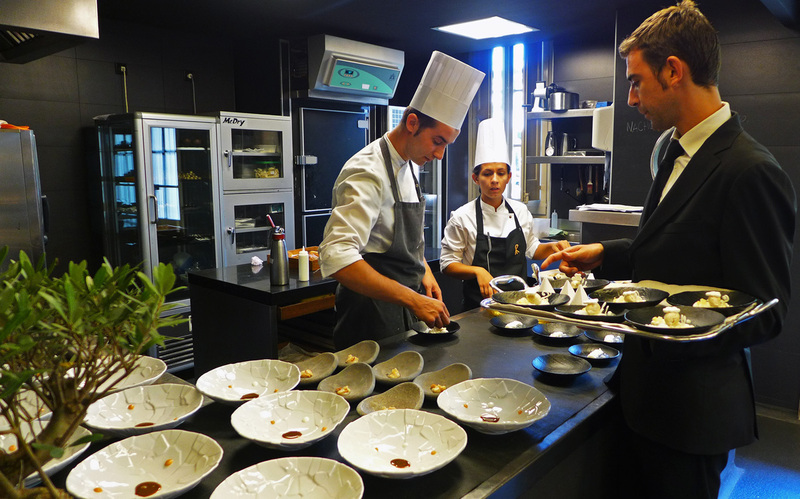 I also met Joan Roca during a tour of his amazing kitchens who was also softly spoken and very humble. He welcomed both myself and my son Max backstage with a full tour to meet the staff…..so impressive. 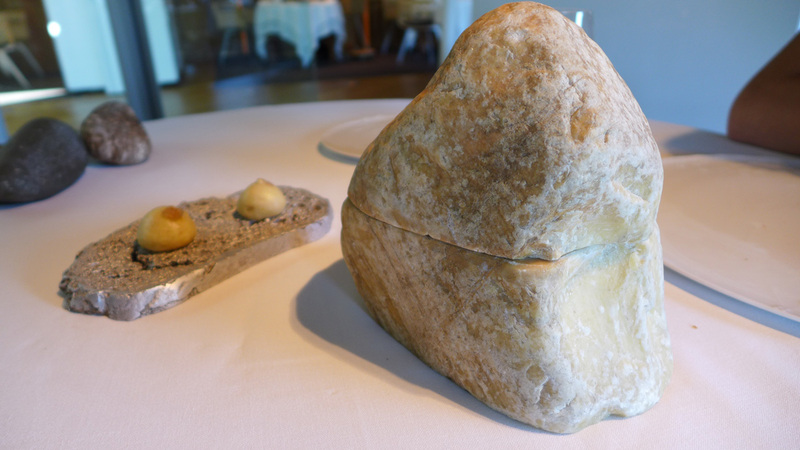 Overall , they have the whole package at can Roca , the best of everything that the culinary world can offer but i have eaten better food almost on my doorstep in Cumbria so you can`t please everyone. 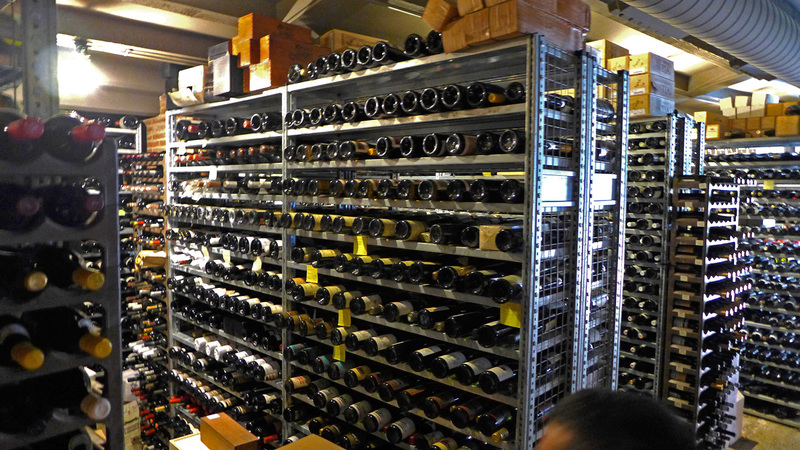 A tour of the Hi-Tec wine cellar housing 30,000 bottles of wine from around the world…try and put a value on that lot. 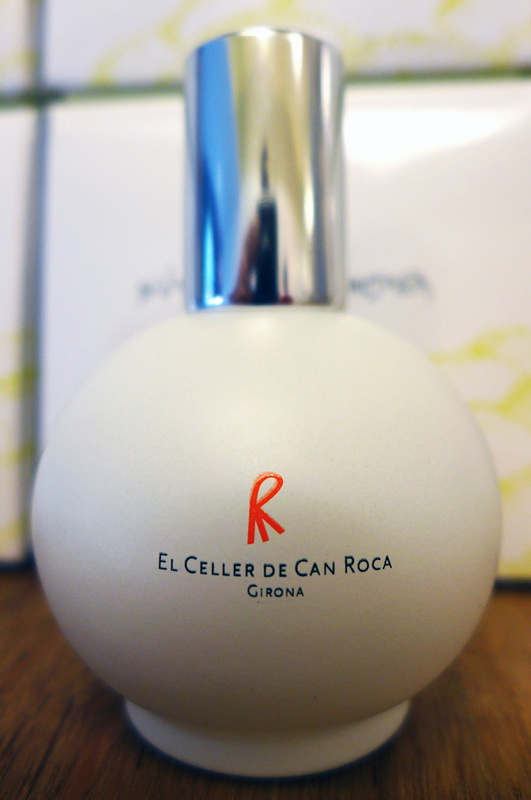 Fragrance of El Celler de Can Roca in a bottle. Take away for 50 Euros…I have to admit it was a beautiful aroma. Believe it or not i was still hungry and my son Max , without prompting actually asked me ” Where we eating tonight dad ” ? Within a few hours we were sitting with cold beers in the city square with plates of Tapas. 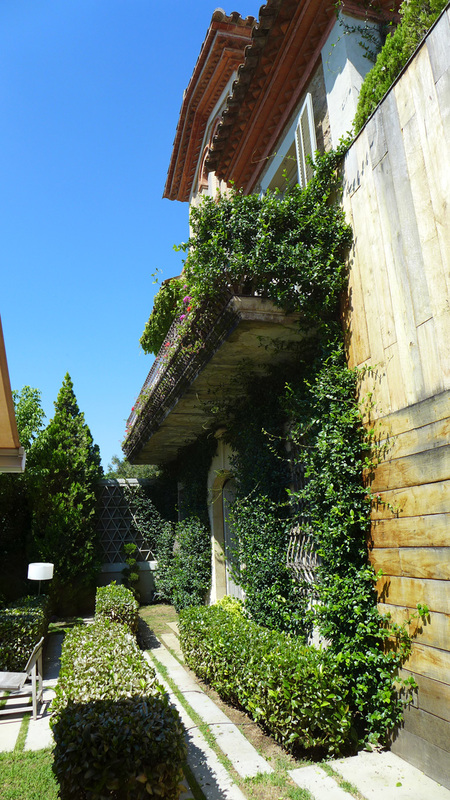 Previous Post Rocambolesc , Girona …. Could this be the Worlds best ice cream shop ? 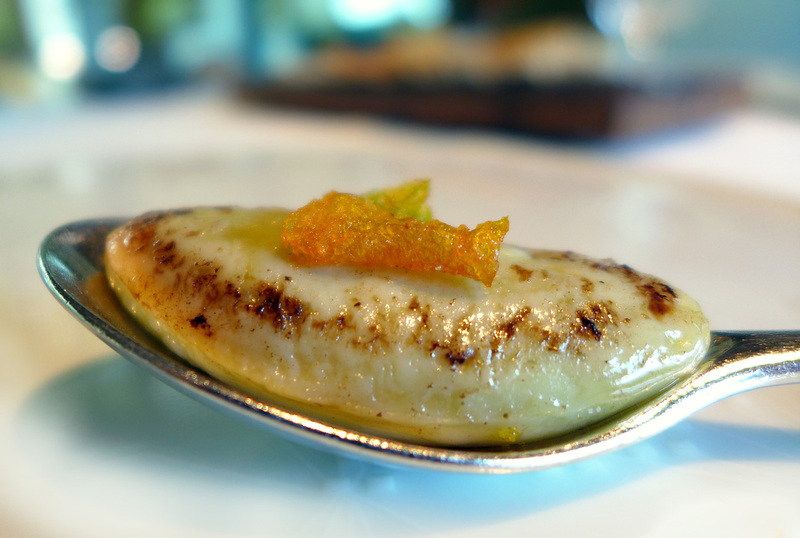 Next Post Restaurant Massana , Girona and the dish of a lifetime. Looks like a great meal. 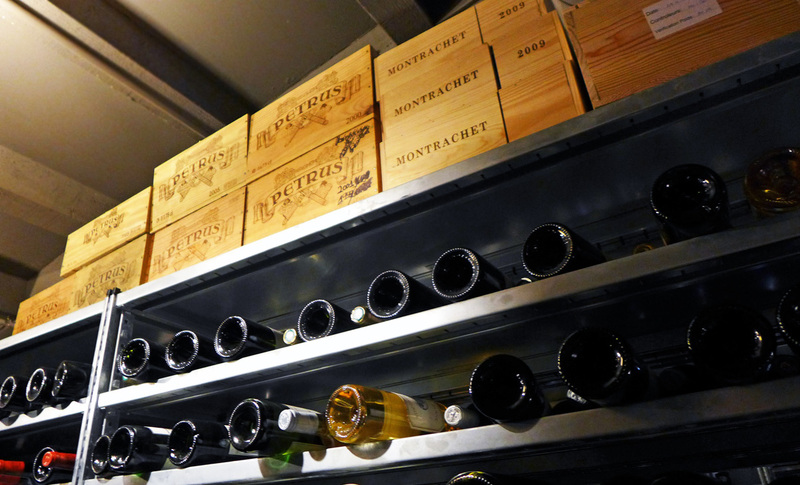 I think I’m a bit like you, at all the multiple michelin restaurants I’ve eaten I always crave two, at least one, big meat courses with a bold red wine (and often don’t get it in my limited visits to those places). Read some other reviews of yours where they served those, but it looks like el cellar is really constrained on meat courses and portions. Btw, sorry to hear about your friend! From what I’ve read it looked like a top notch guy. Would have loved to eat out with the two of you and drunkenly walk out of a restaurant.